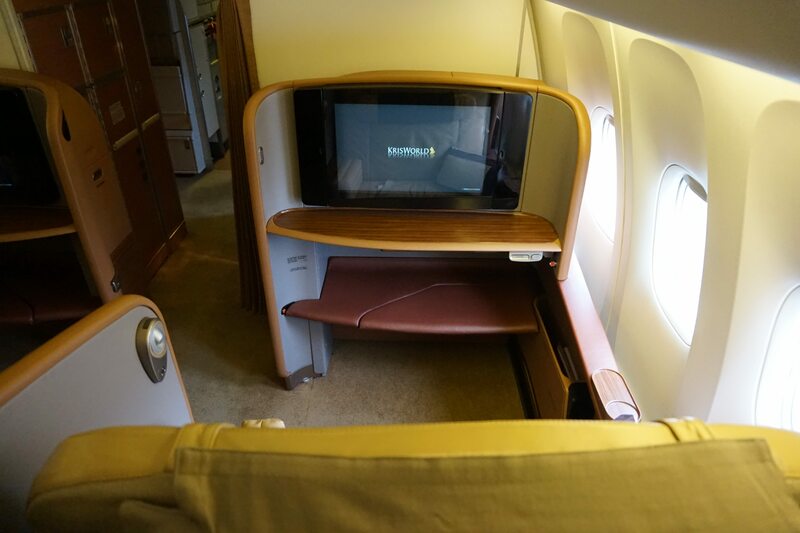 A review of SQ's 2006 First Class product- the seats, the service, and of course...the ramen. 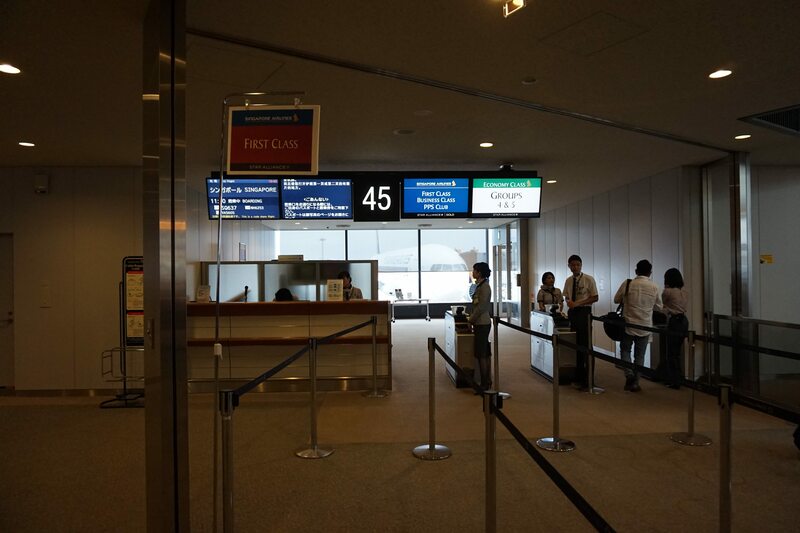 Today’s SQ637 flight would be boarding from Gate 45, which was very near the ANA Suite lounge. 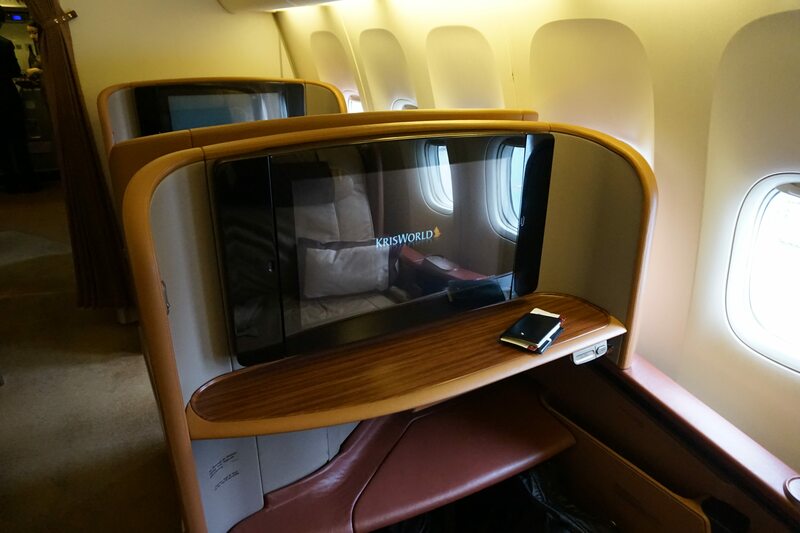 I left the lounge a bit late and boarding of First and Business class had almost finished by the time I got to the gate. 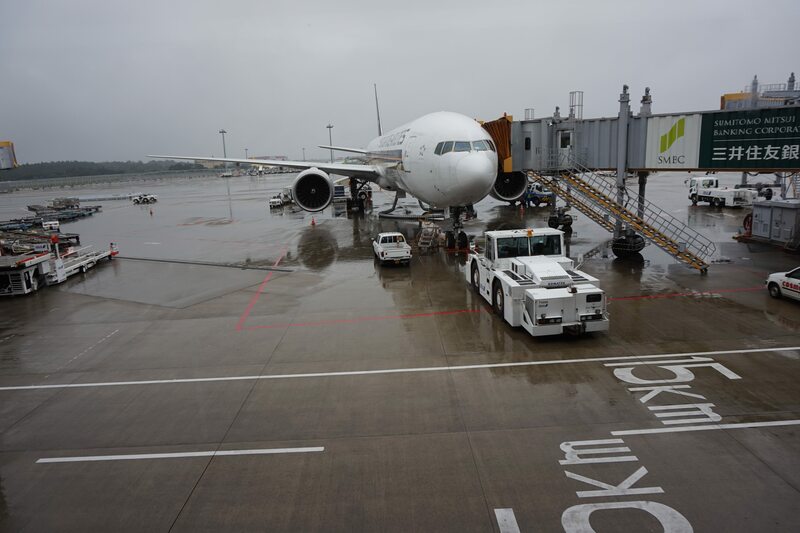 Once the ground staff saw my red boarding pass, however, they quickly brought me to the front of the line and got me through. 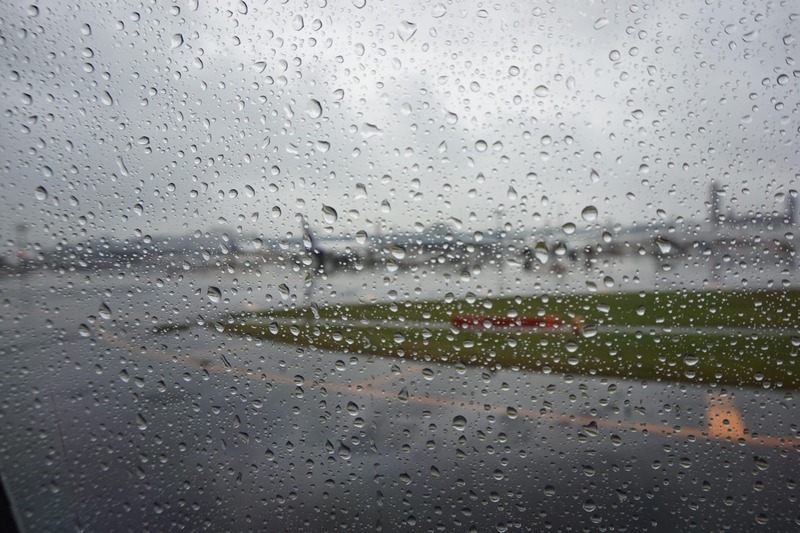 It was a very wet day in Narita, and with no sign of the rain letting up. 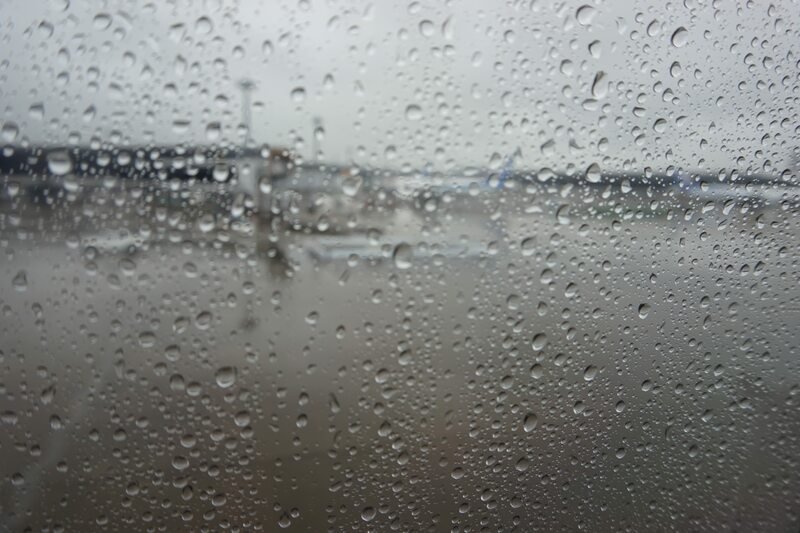 You could hear the rain hammering down on the metal roof of the jetbridge. Throughout the trip I had been shooting video with the intention of creating a YouTube story about the Tokyo Ramen Run. I had dreams of Buzzfeed and other low rent clickbaity websites picking up on this with YOU WON’T BELIEVE HOW THIS GUY ATE HIS INSTANT RAMEN headlines. The story would go viral, and I would ascend to the pantheon of YouTube influencers, forever annoying and entitled. But the one conclusion I came to over the course of my trip was that I’m really not cut out for video making. I already find it stressful enough taking photos of every last thing I do. Shooting video? Totally different ballgame altogether. 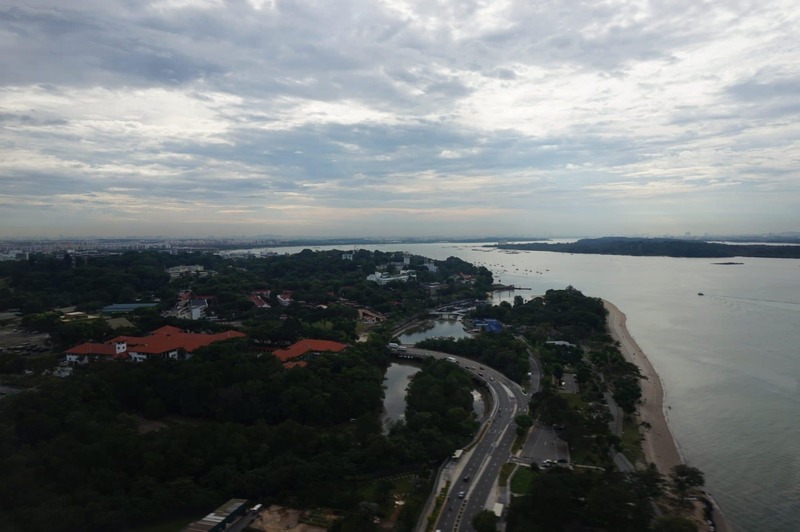 You have to think of storyboards, and transition scenes, and narrative flow may require filming in places where filming is difficult or not strictly allowed. You have to cut the video, add annotations and voiceovers and background music, fiddle with your lighting, remove background noise, combine clips… I realised it was a nightmare the minute I started trying to put it all together. Take something as simple as a transition shot of me walking down the jetway. And then look at what I have to deal with. 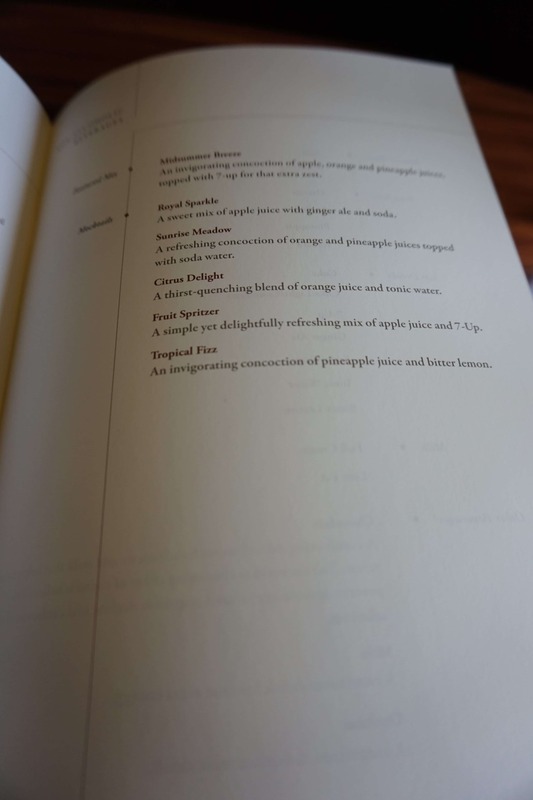 Shaky, Normandy beach esque camerawork, my stupid out of breath voice revealing I’m not the Adonis my Tinder profile suggests I am, my uncertainty about filming the crew without first asking them….frankly, writing is so much easier. 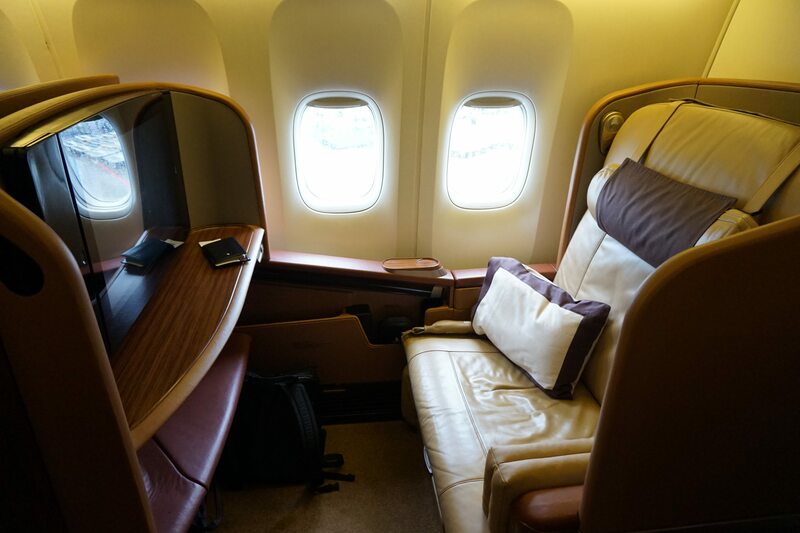 I boarded through the forward door where I was greeted by the crew and ushered to my seat. 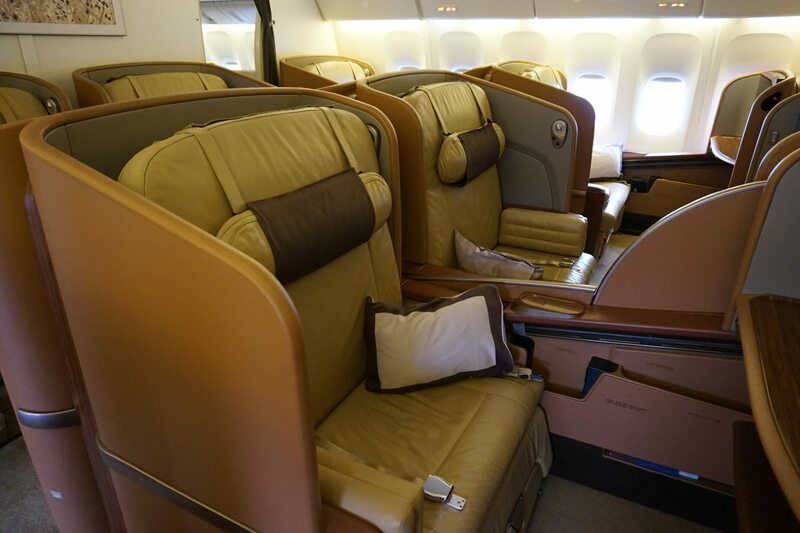 This aircraft was configured with SQ’s 2006 First Class seat, instead of the newer 2013 version. This old girl was quite something when she was first launched, but 11 year of service mean she’s seen a lot of mileage. 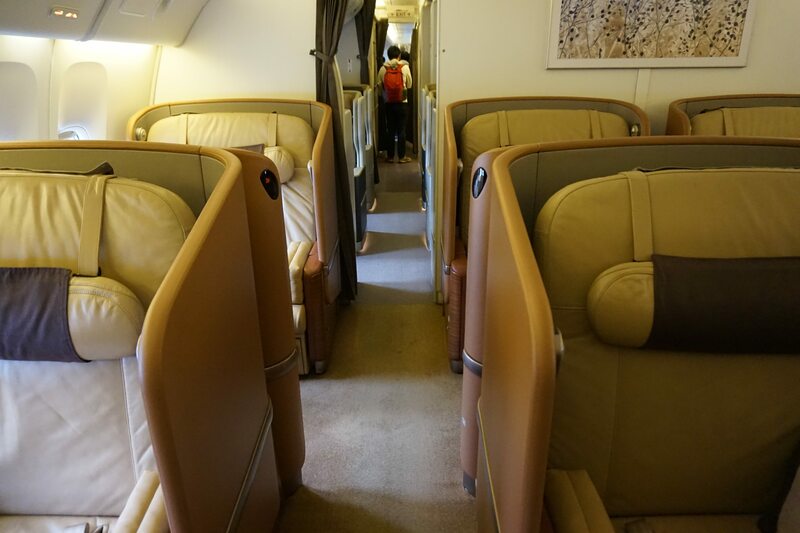 Granted, First Class seats don’t see as much wear and tear as seats in business or economy (on account of them going out empty way more frequently), but you try looking good 11 years after your prime. 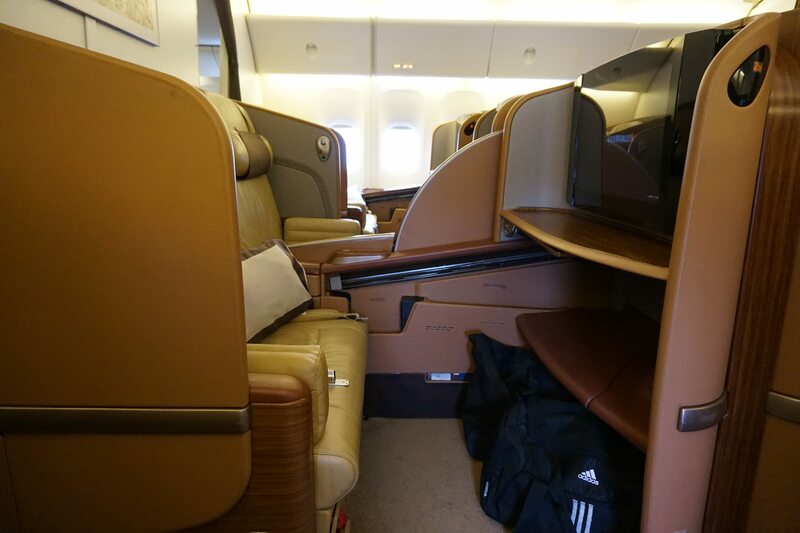 There are a total of 8 seats in this configuration, spread over 2 rows of 1-2-1. 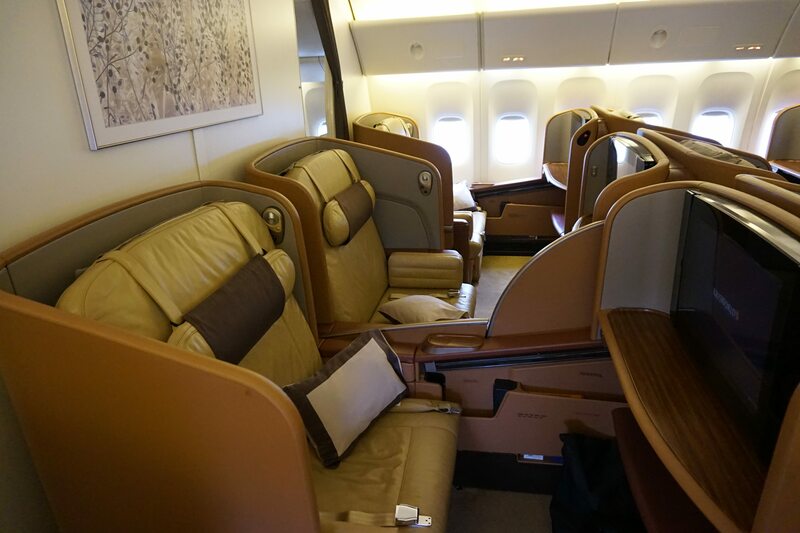 Perhaps it’s intentional, but the color scheme of the seats brings back memories of the old 747 Sky Suite, a product I unfortunately never had the chance to try. 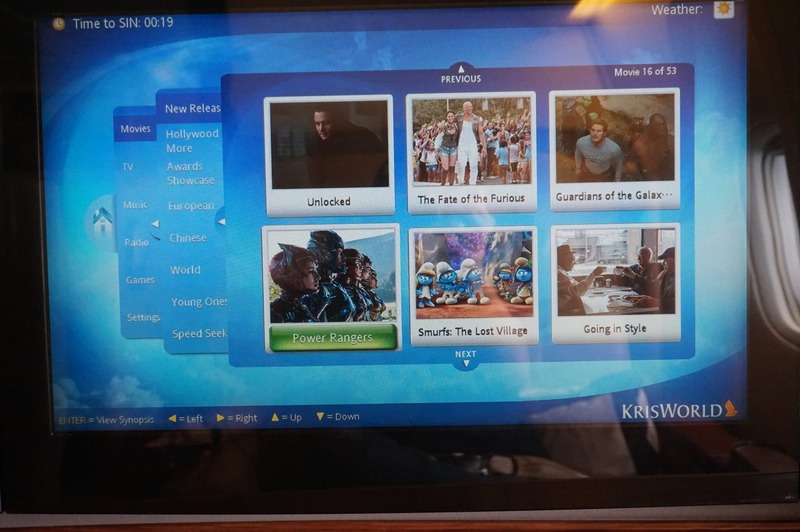 I chose seat 2F, on the starboard side of the plane. There was only one other passenger in the cabin today who settled into 1A. 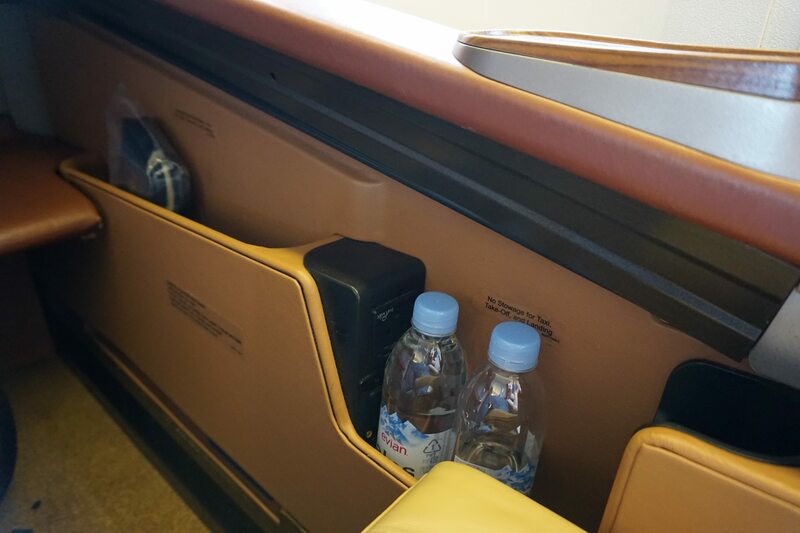 The seats have plenty of underseat storage, as well they should because there are no overhead bins in the First class cabin at all. This creates the impression of more space. 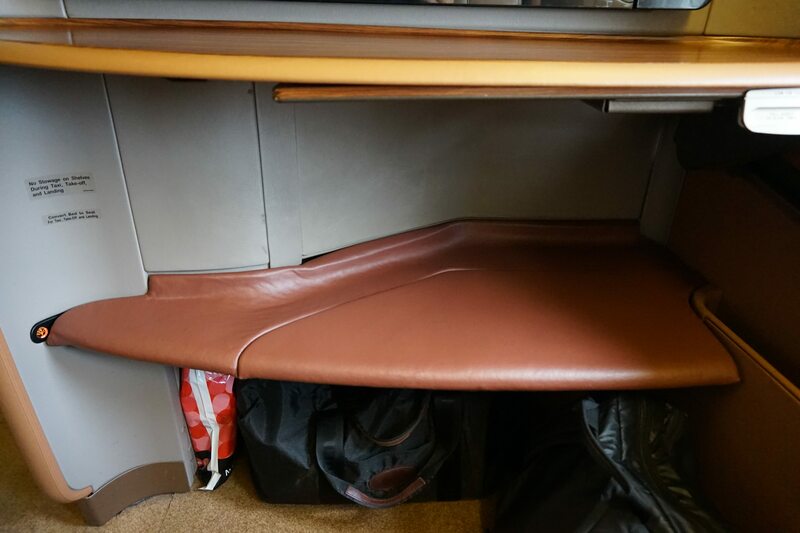 The area under the footrest can easily store a large carry on, and the crew can store other items under other unoccupied seats or in the closet. The seats have fairly decent privacy, with the “ears” of the seat blocking you off from the aisle. 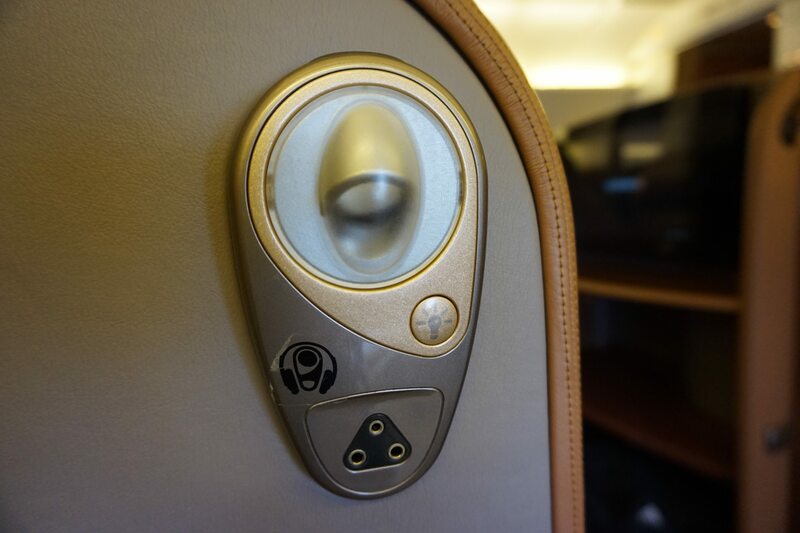 If you’re in the middle there’s a privacy divider that can be raised (but it needs to be down for takeoff and landing, which give you virtually 0 privacy from the guy next to you, surprising for a First Class seat). 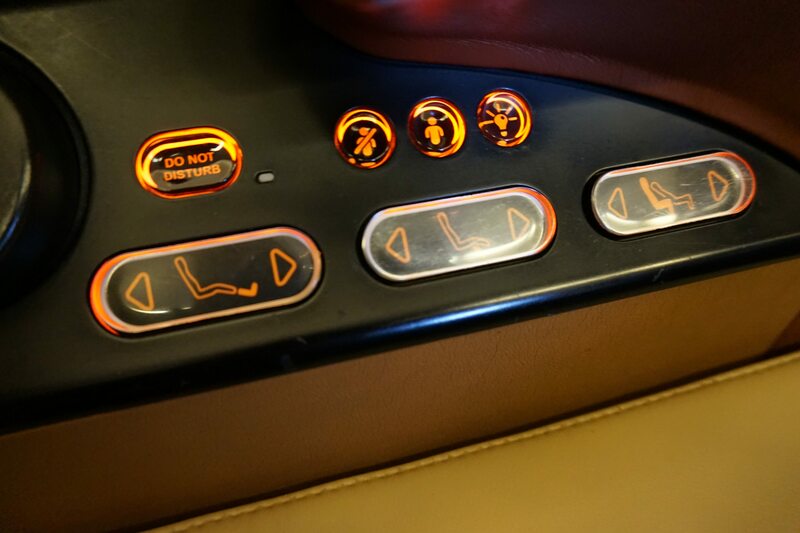 Seat controls are very simple. There are two for the foot rest and one for reclining. 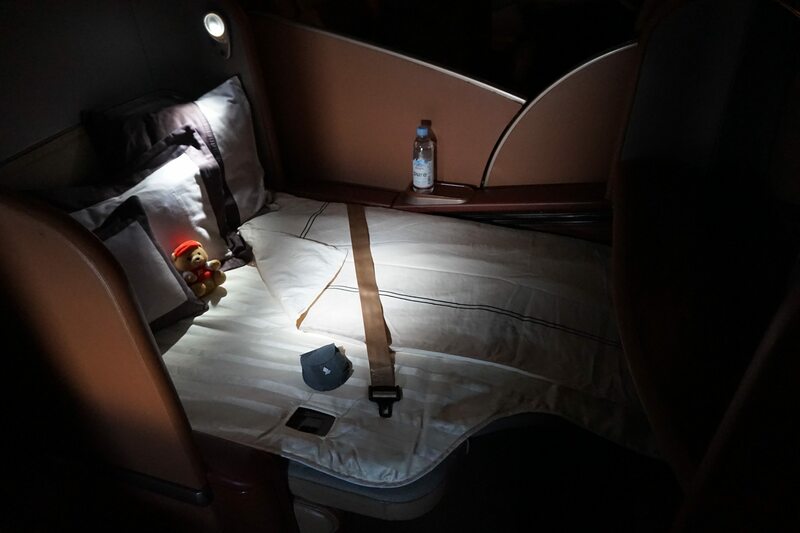 Note that with this seat, you’re reliant on the crew to convert it to bed mode. 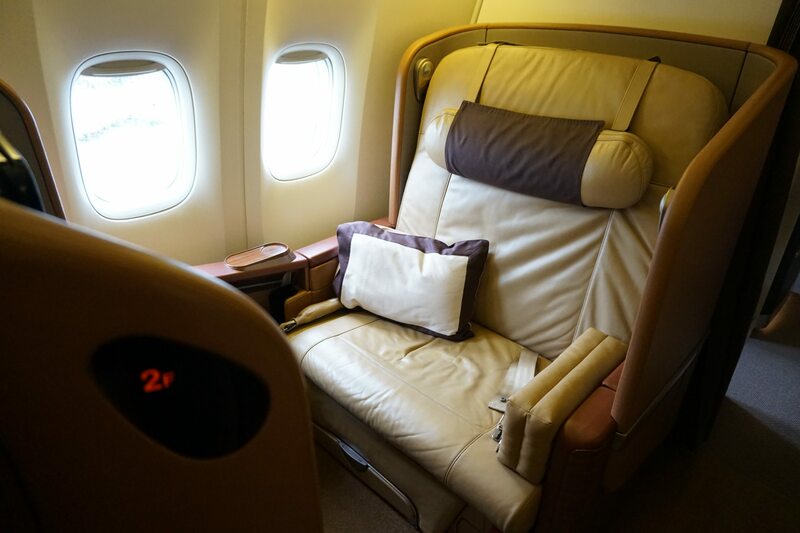 They’ll happily do it, of course, but it’s not like other first class seats I’ve seen where you could do it yourself if you were so reclined inclined (I’m so funny). Near your head is a reading light with several different brightness settings, as well as the headphone plug. 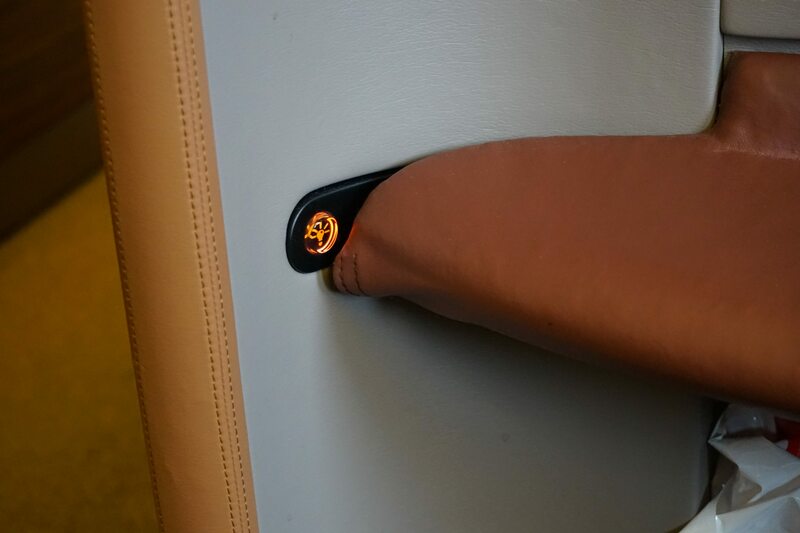 Interestingly there’s a small light button near the footrest too. I never quite figured out what it does but I think it’s meant to be a nightlight to help you find your shoes. 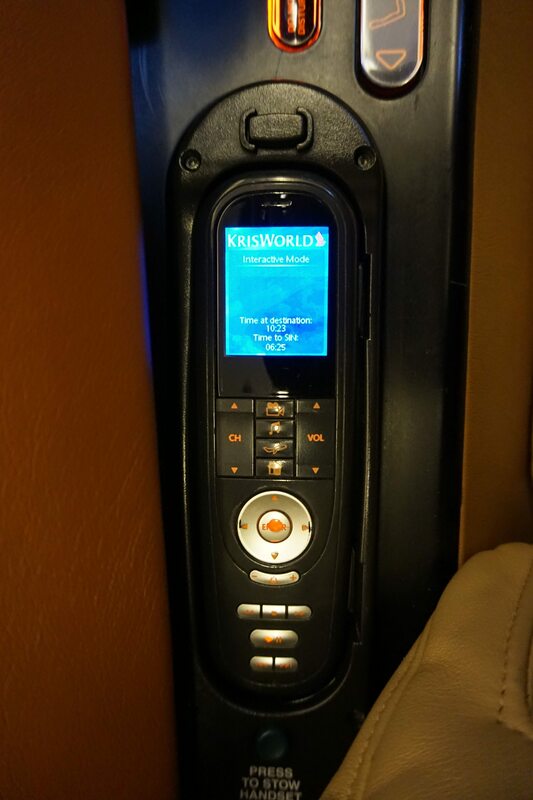 The IFE remote is definitely last gen, and you can see how the oil of many passengers has eaten away at the some of the button labels. 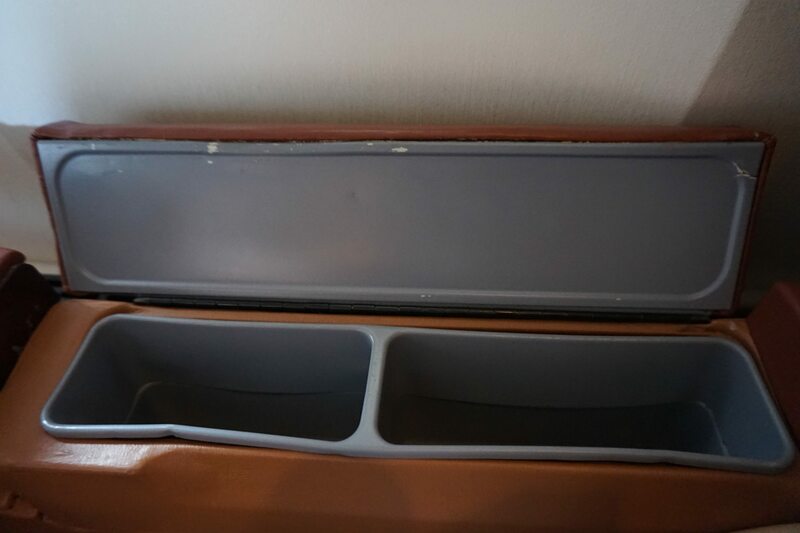 There’s a lot of space to store/lose things, like this compartment in the armrest. 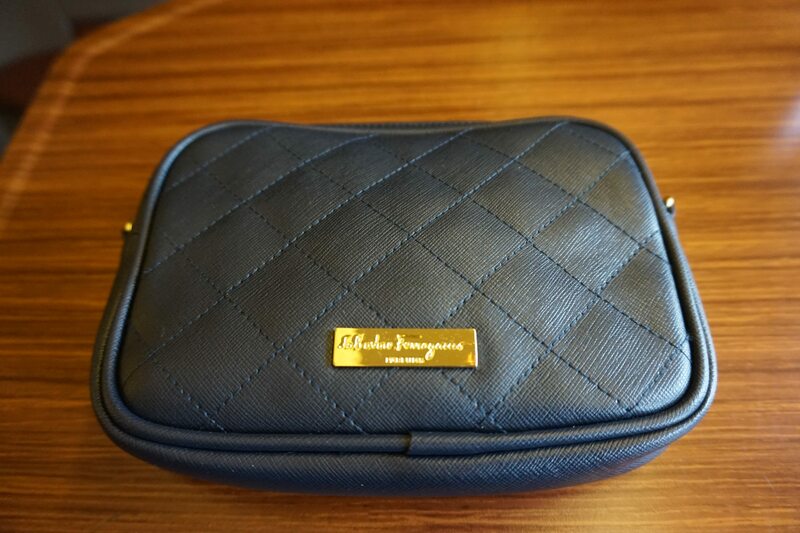 More storage can be found in the side pocket, where literature and the safety card are kept. 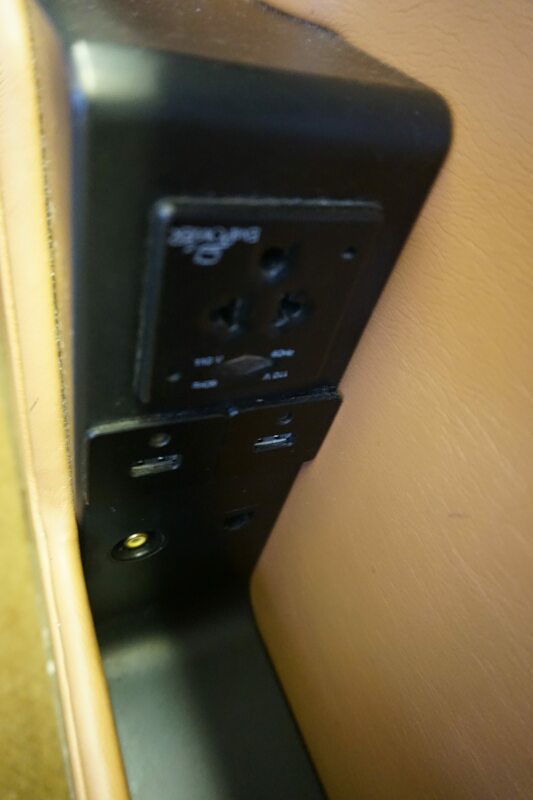 Here’s where you’ll also find the EmPower outlet and two USB charging ports. 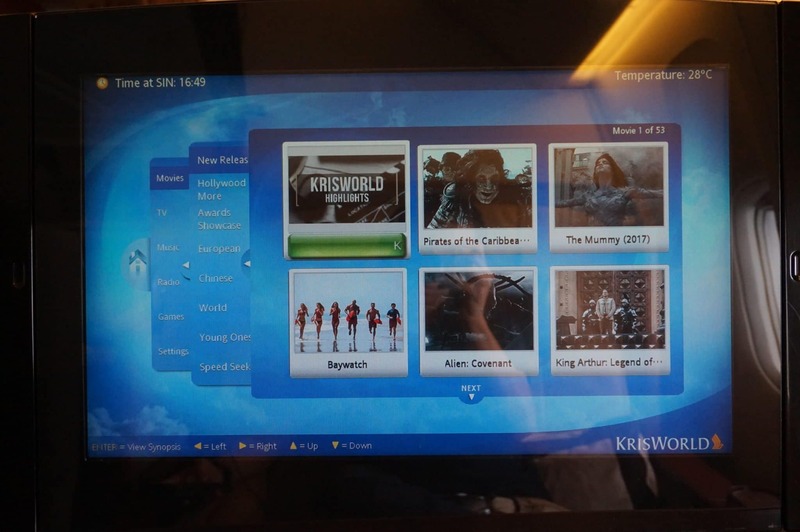 The screen is 23 inches wide, which was unheard of back in 2006 when the seat was launched. It’s of course no match for the newer higher resolution screens, but a solid display nonetheless. SQ made the switch from QC15 headsets to QC25s some time back. 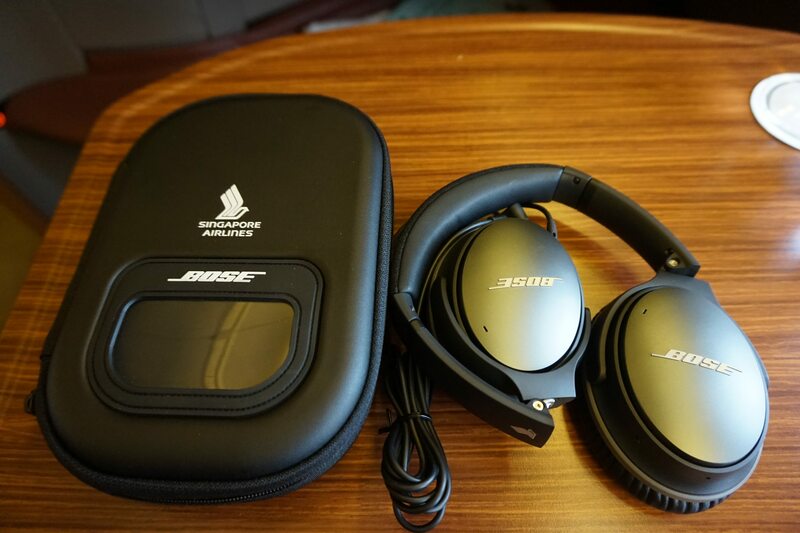 I’m still waiting for an airline to introduce wireless headsets eg the QC35, because that’s be a game changer. 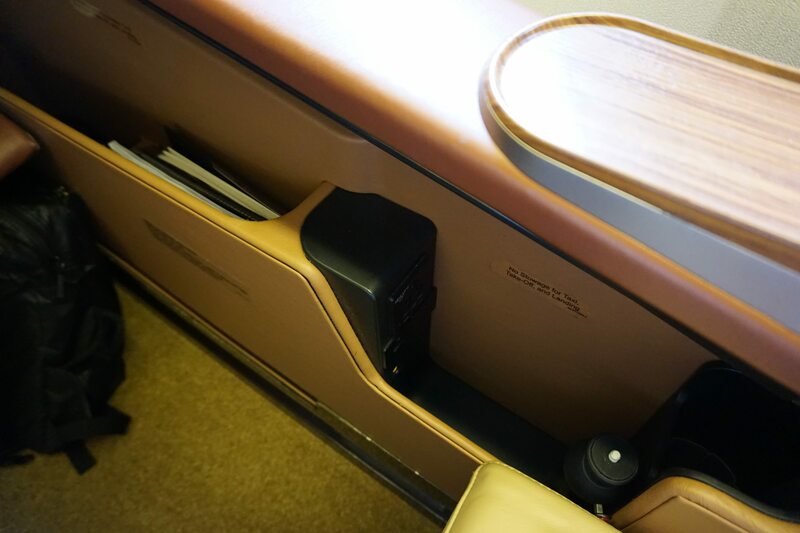 No more wires to get snagged in seat corners or knock over your drink. The crew came around to introduce themselves and ask me what size PJs I’d like. 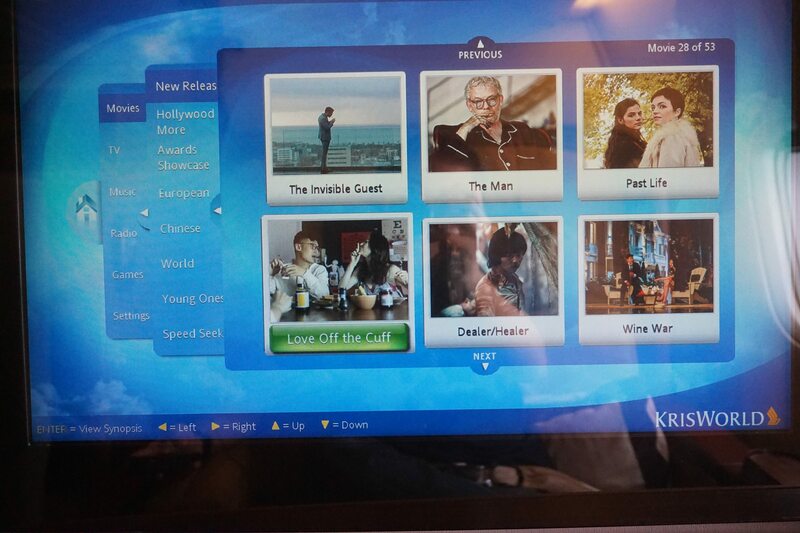 I didn’t expect them to offer PJs on a daytime flight, so this was a nice surprise. 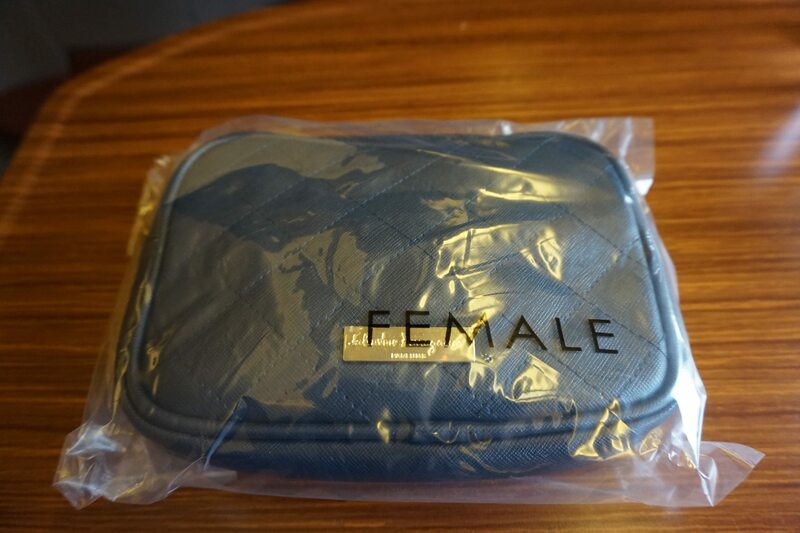 I already had several of the male amenities kits from my previous First Class jaunts, so I requested the female kit this time round. I have to say I quite like the female kit. 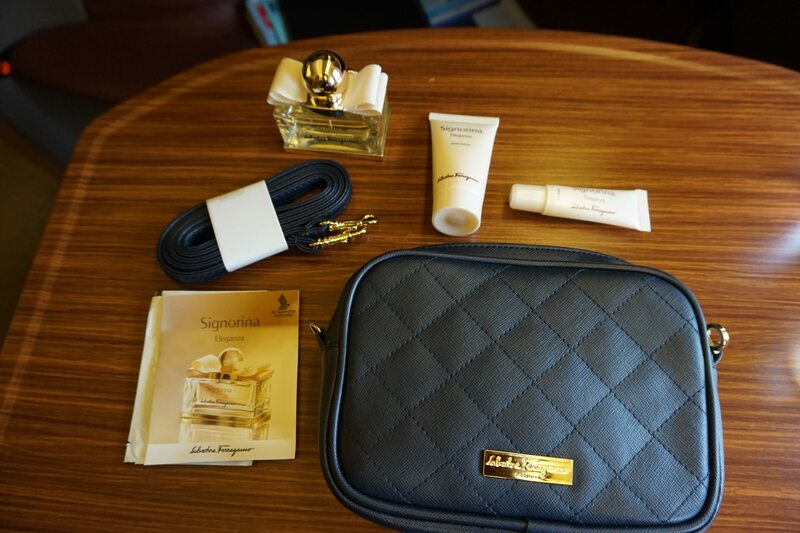 It’s more sleek than the male kit and comes with perfume, lip balm and hand cream. It also has a little strap so you can carry it like a purse. 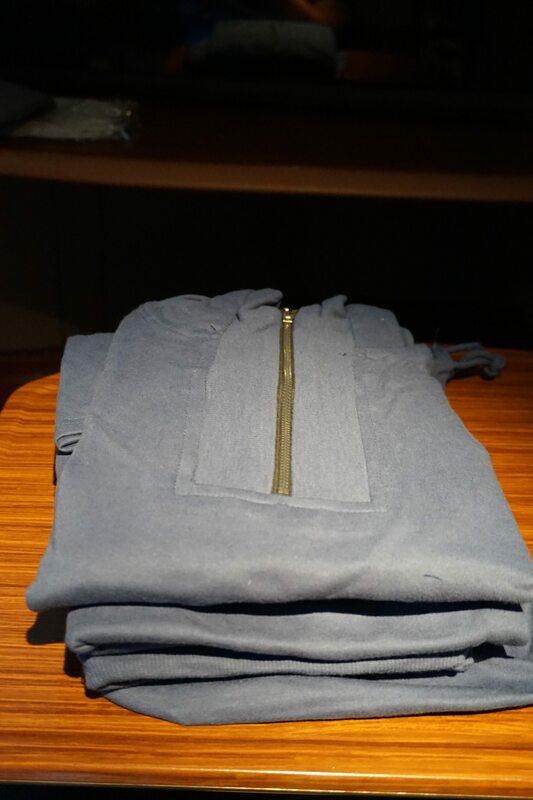 SQ’s sleeper suit is now a light blue instead of grey (or maybe they have both kinds and just rotate). It’s very comfortable for sleeping and when in doubt, always pick one size bigger than you think you are. 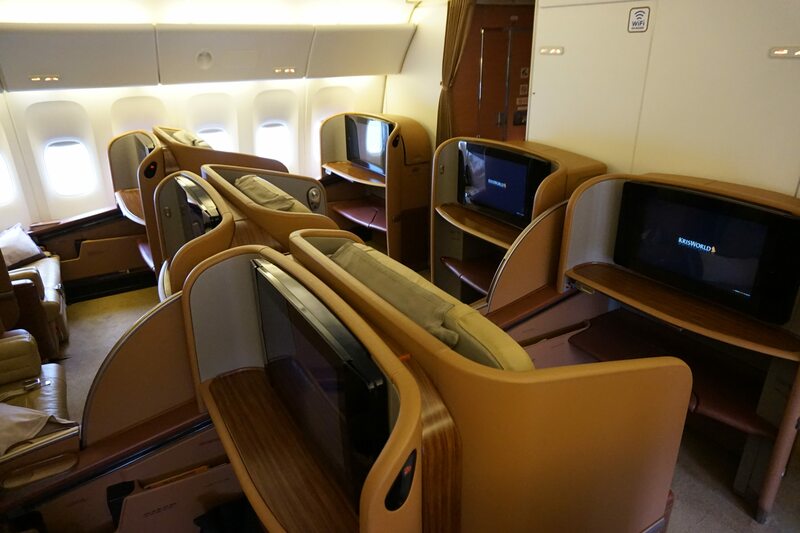 At least SQ keeps its cabins at a reasonable temperature, unlike some other Asian airlines which seem to have a phobia of cold. 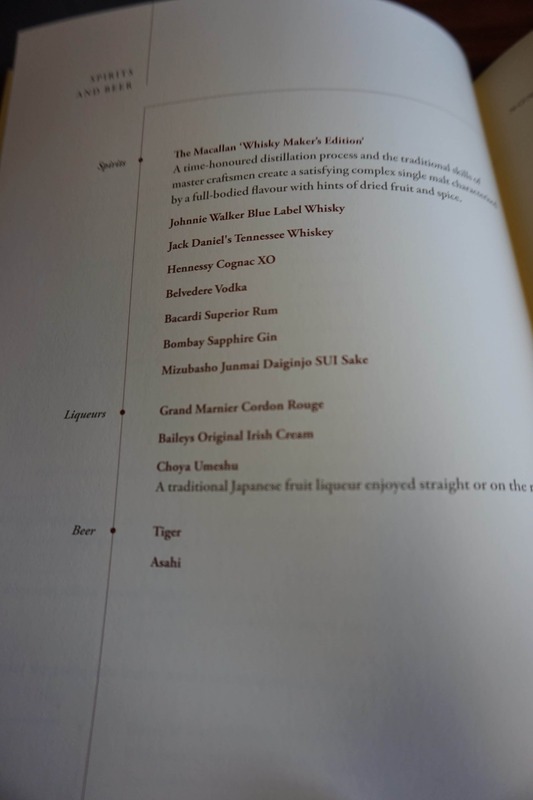 SQ does serve champagne on the ground in Tokyo, and the age old Dom/Krug debate resurfaced. 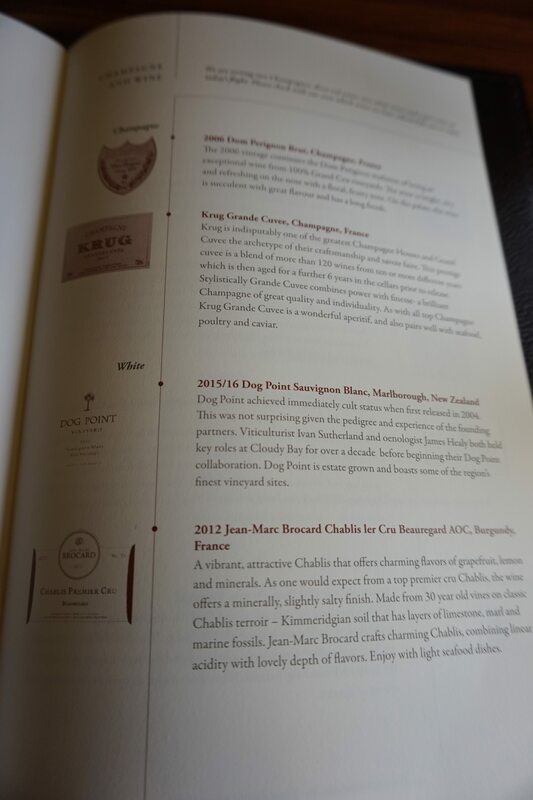 I decided to go with Dom on the ground and Krug in the air, or maybe it was the other way round. 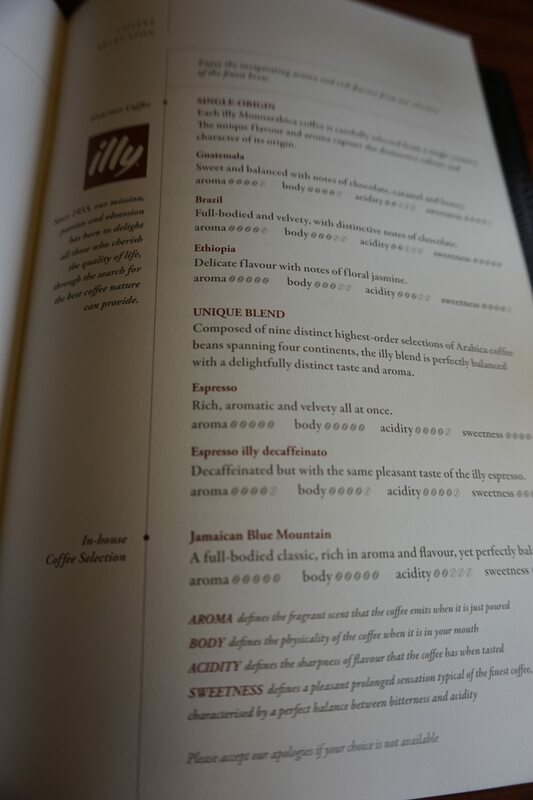 I will say that I can now taste the difference between the two, a fact for which I am very proud. I also had some still water (Evian) to go with it. 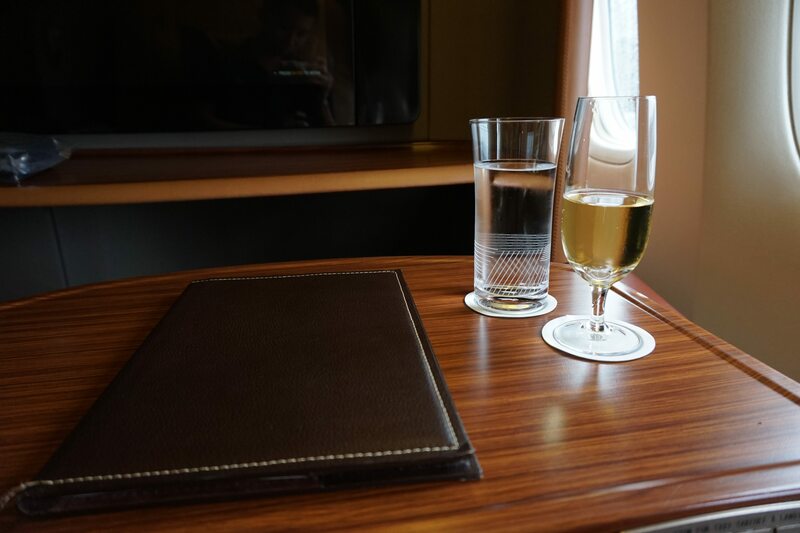 What I like about First Class is they give you big water glasses. I drink a ton of water on planes, and in J you always have smaller glasses that need plenty of refills. 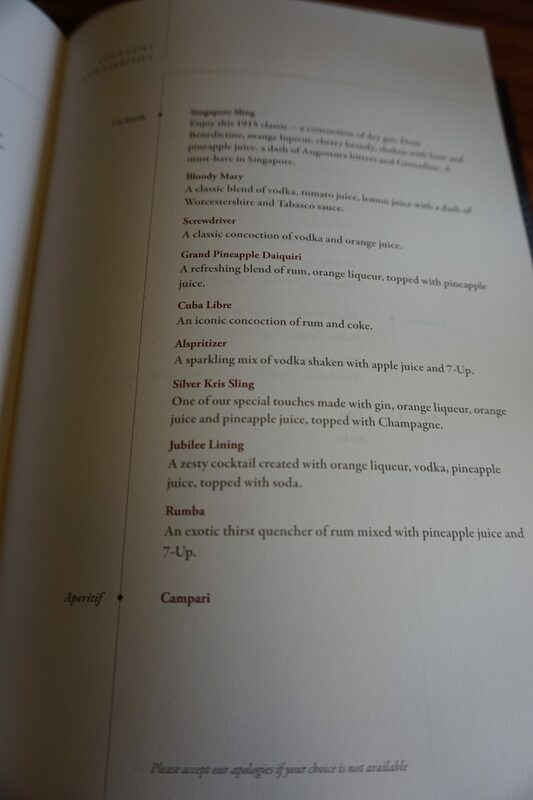 The menu was delivered along with the pre-departure drinks. 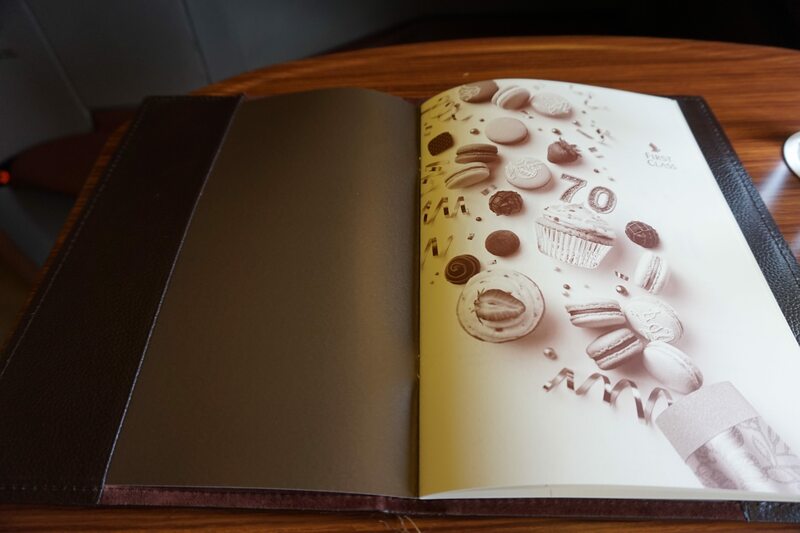 Here’s the international menu for comparison. 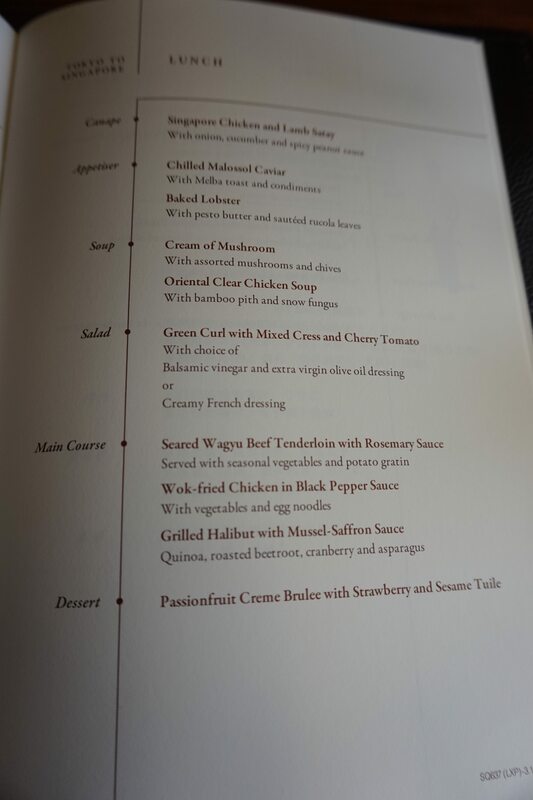 Maybe it’s just me, but serving wok -fried chicken in black pepper sauce with egg noodles seems a bit cheap for First Class. With some liquid courage in me, it was now time to brief the crew on what I was trying to do today. 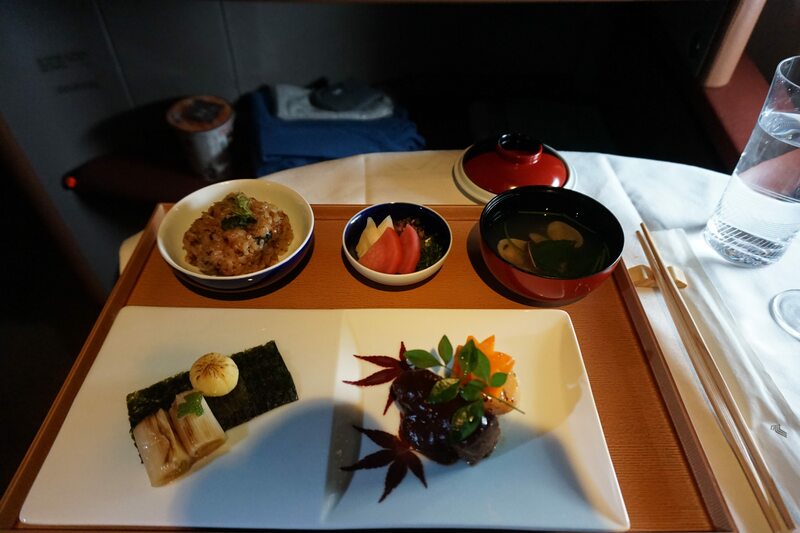 I flagged down the leading stewardess serving the First Class cabin and gave her the quick rundown of the Tokyo Ramen Run and how she could help me today with the taste test. She was more than willing to help out (I gather this wasn’t the strangest request she had ever heard), but said she needed to clear it with her inflight supervisor first. 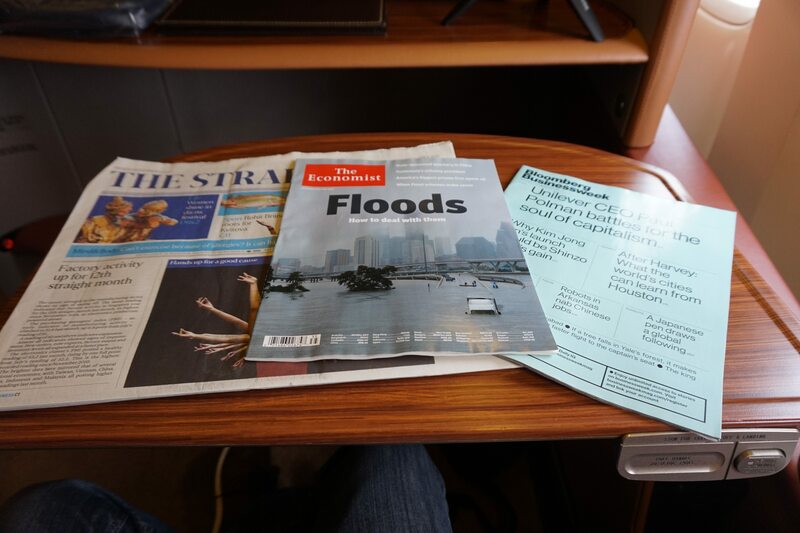 Before takeoff, the crew returned with copies of the Straits Times and assorted magazines. 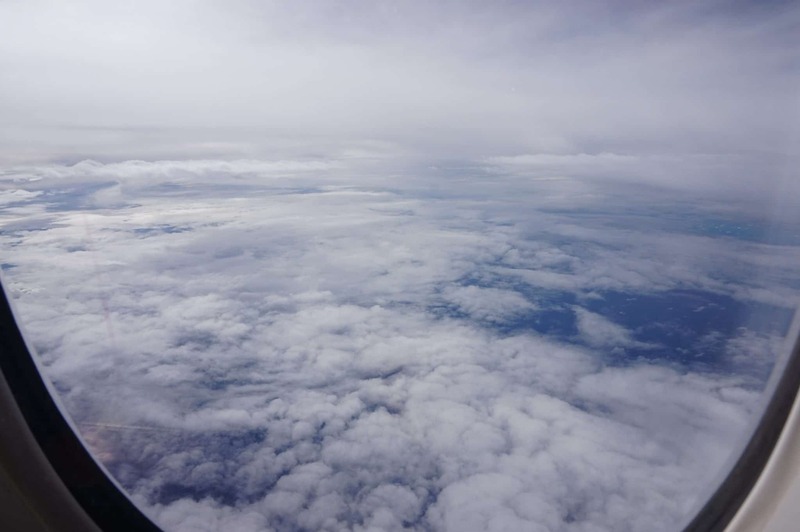 Once we got to our cruising altitude the crew sprung into action. 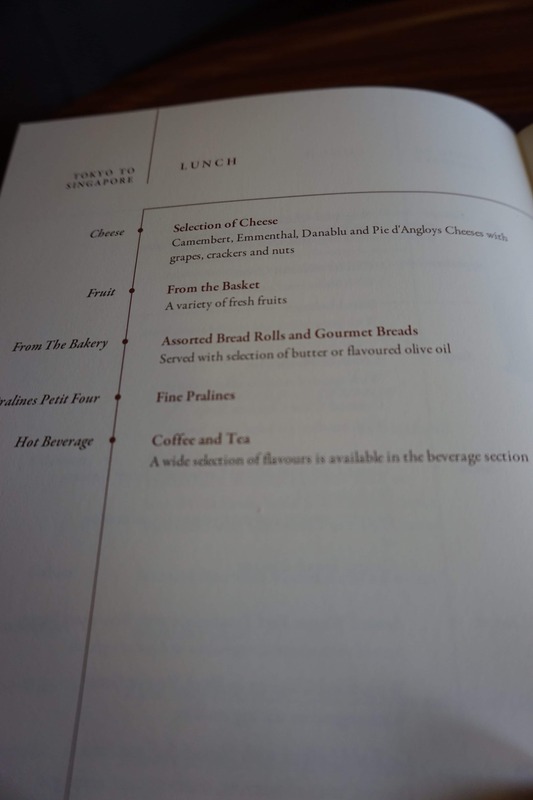 I had told them that my plan was to have lunch straight after takeoff, go for a nap and then two hours before landing start shooting the taste test. Satay was served to start off lunch. I’m still not clear why SQ serves the satay course without the table cloth (both in F and J), given that the rest of the meal happens straight after. I liked that the plate they served it on had a little SQ logo on the bottom right. 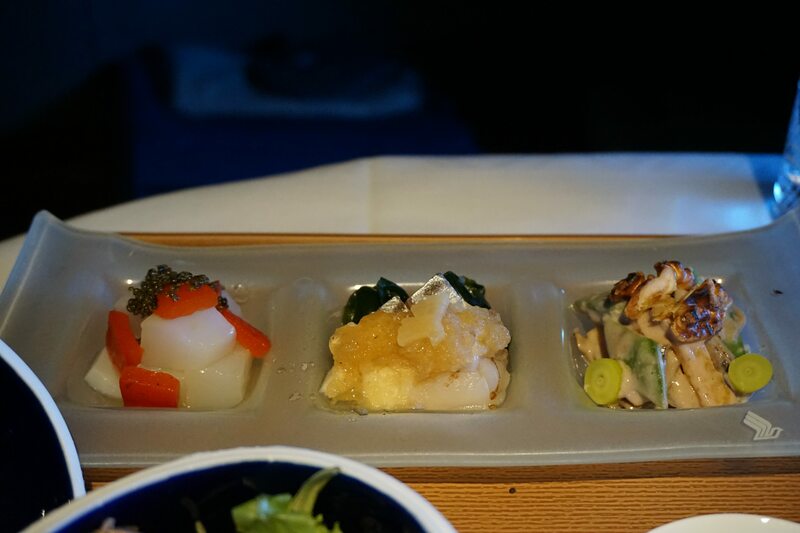 The sakizuke is served together with the mukouzuke, a sliced dish of seasonal sashimi. 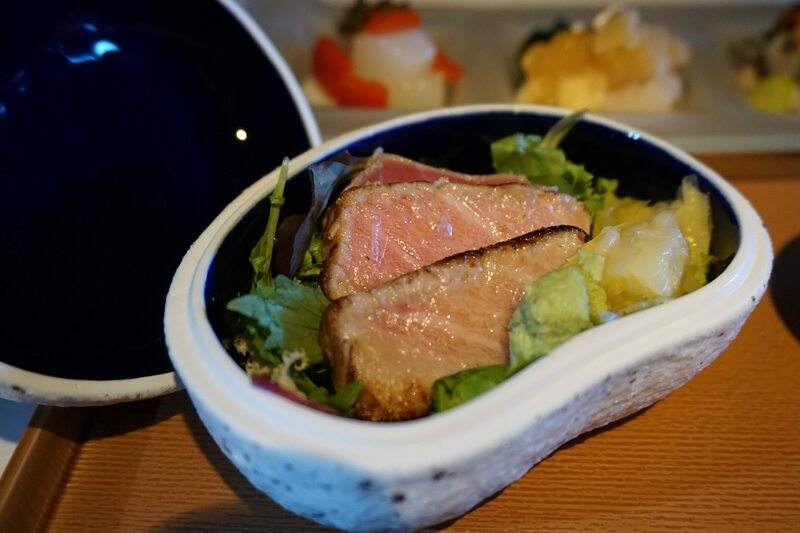 I did enjoy the tuna belly marinated with moro miso and wasabi. The accompanying salad of yellow chive, soy sauce with yuzu and mustard gave a nice crispness and tang to accompany the fish, which was very fresh. 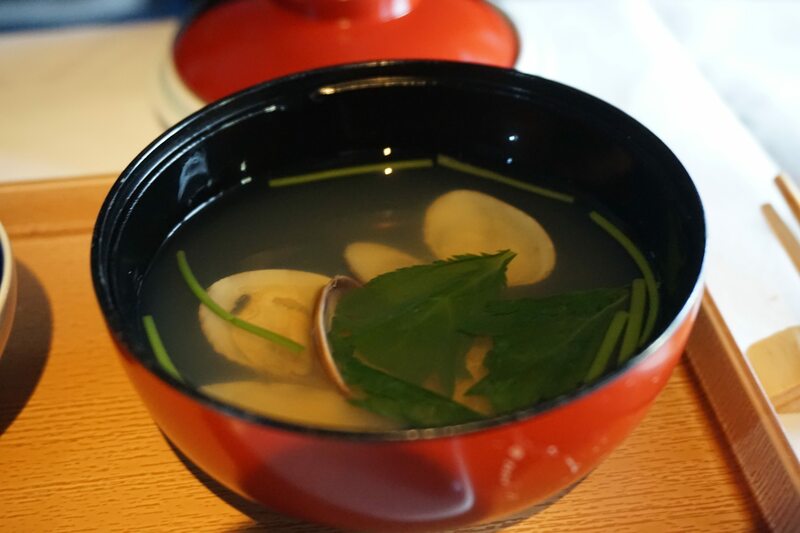 The next course of oshinogi featured buckwheat noodles, simmered shiitake mushrooms, egg julienne. 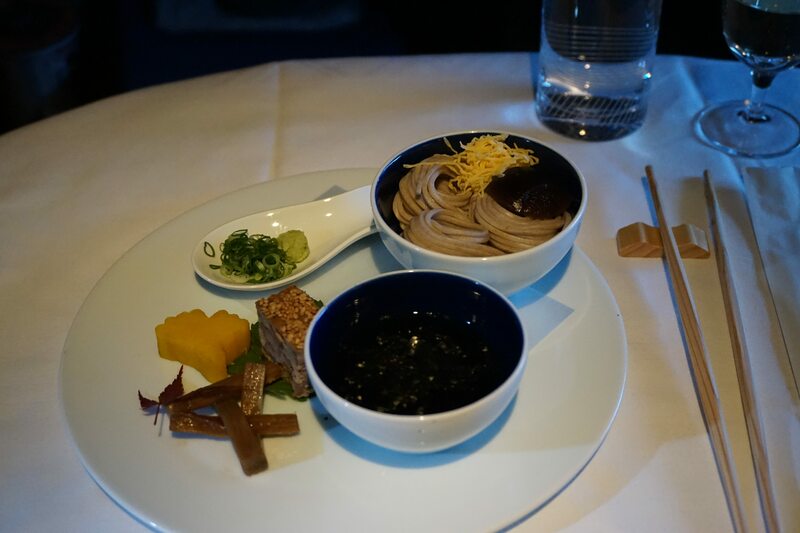 This was served along with chopped kujyo leek, wasabi, seaweed, soba sauce and chicken liver terrine, sweet potato in ginkgo shape and burdock. I wasn’t a fan of the flavors to be honest. 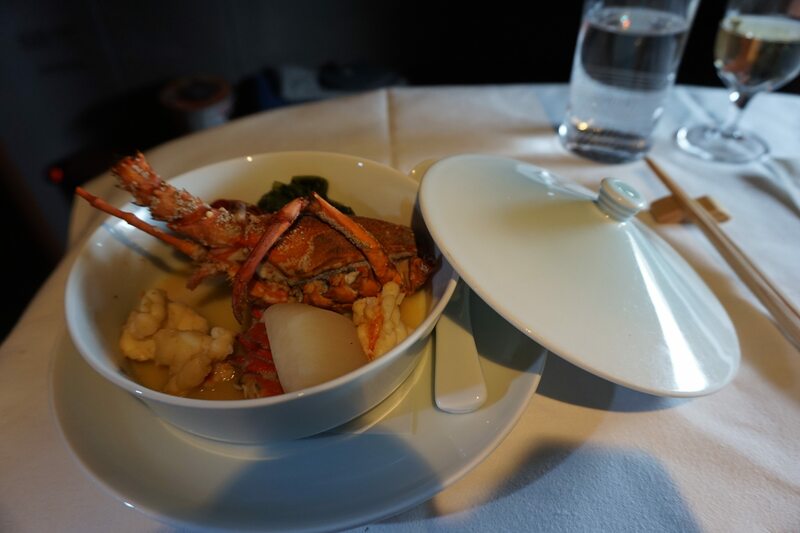 Fried lobster simmered in white miso soup with spinach, turnip and yuzu sounded promising. However the lobster had the disappointing microwaved taste you get when it’s overcooked. 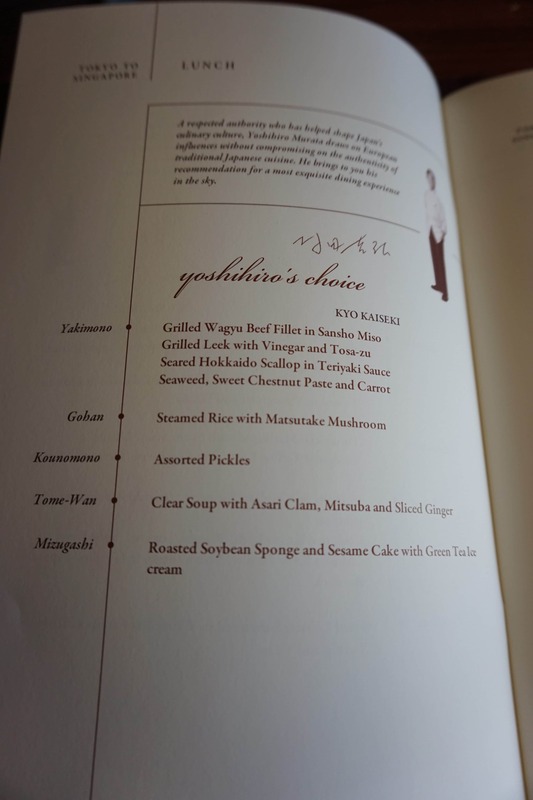 I was looking forward to the main of grilled wagyu beef, even though airplane beef is like playing roulette. 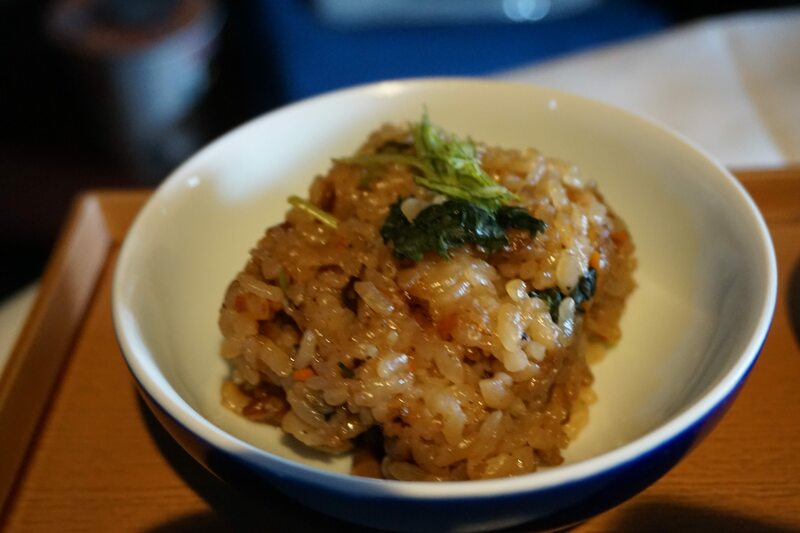 This was served with steamed rice with matsutake mushrooms. I was hoping for just plain steamed Japanese rice, but this was all they had. I thought the rice was a bit too wet and mushy. 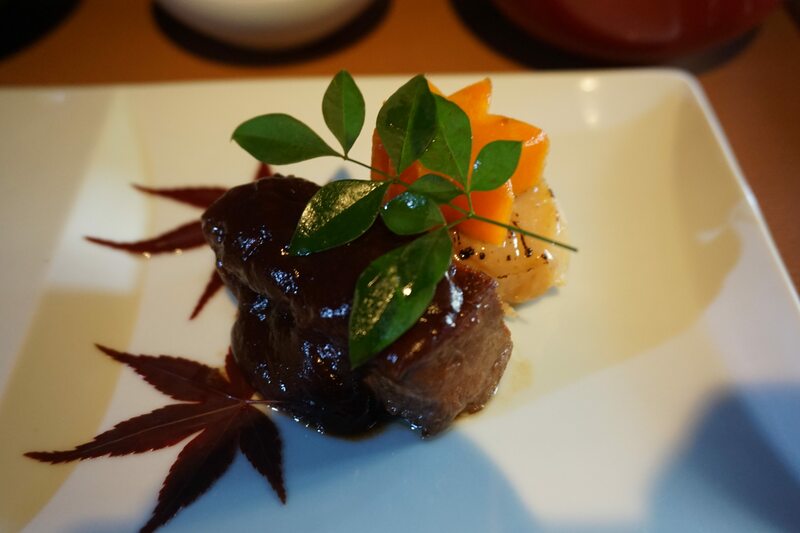 The beef was described as Grilled wagyu beef fillet in sansho miso and seared Hokkaido scallop in Teriyaki sauce. The beef was passable, as far as airline beef goes. It certainly couldn’t compare to some of the beef I had over the past few days. But the scallop was disappointing. It was overcooked and rubbery, and had the same microwaved to death taste that befell the lobster. 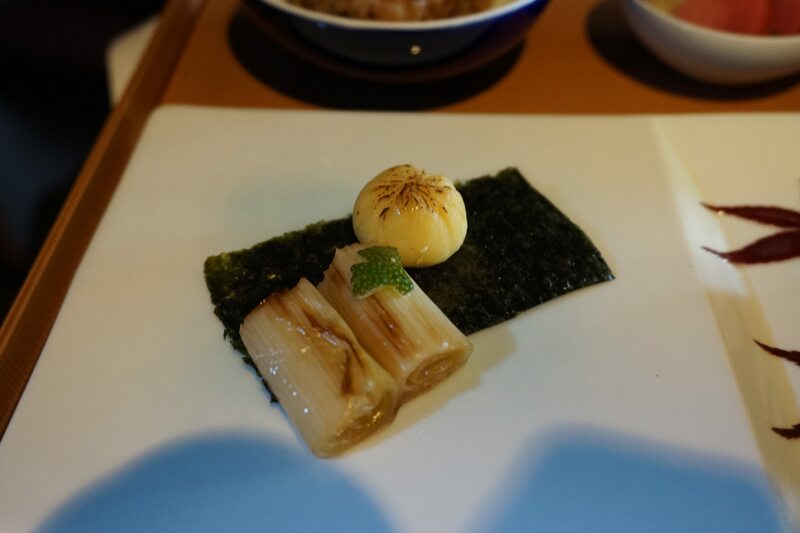 Grilled leek with vingear and tosa zu accompanied proceedings. 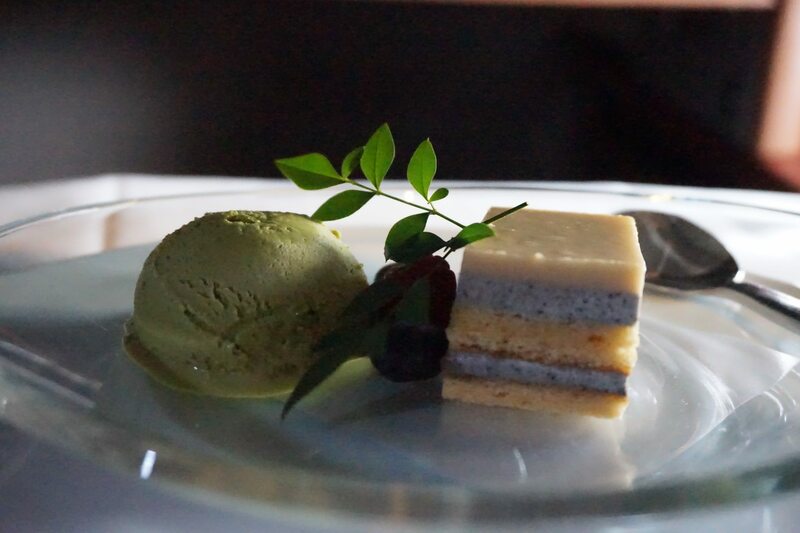 Roasted soybean sponge and sesame cake with green tea ice cream was served for dessert. The sponge cake was nice and light. 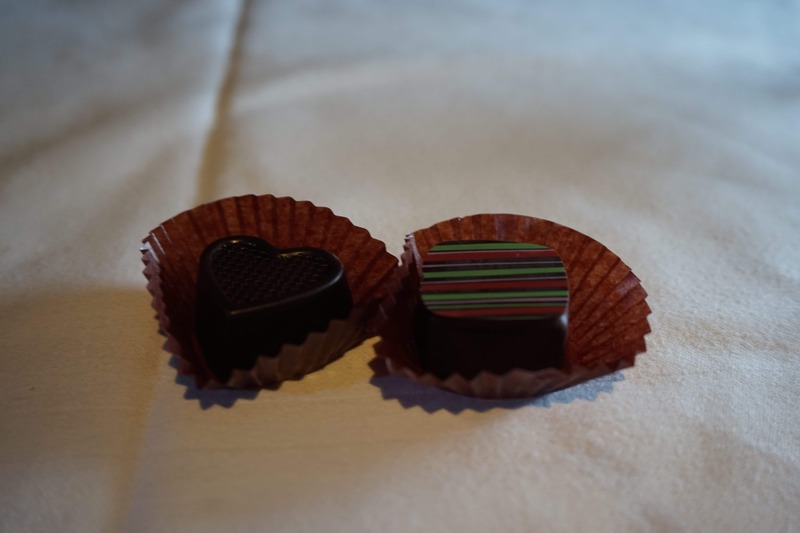 Chocolates were brought around to round off the meal. 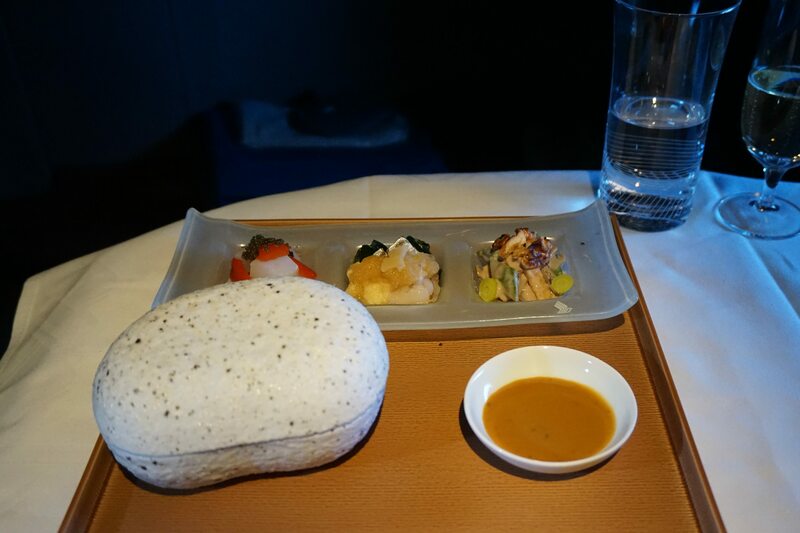 I definitely didn’t think much of the meal, which was disappointing considering the high standards that SQ sets (plus the fact that we were departing from Tokyo). 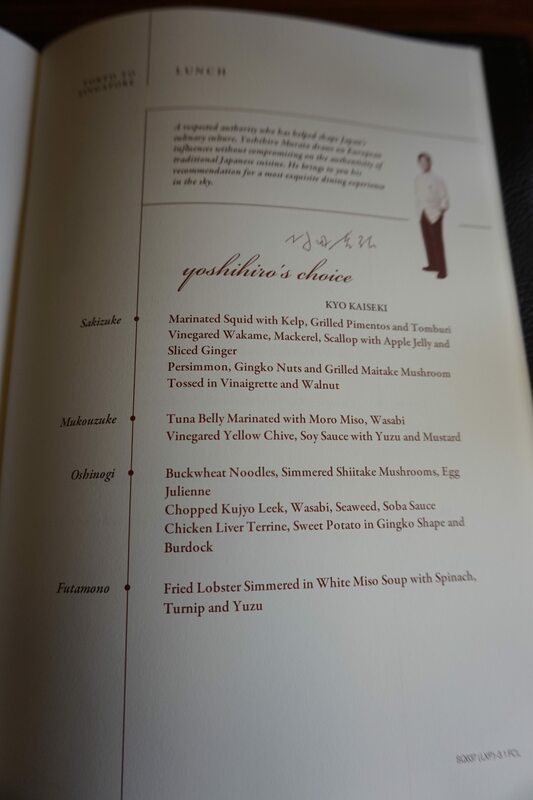 It didn’t come close to the meal I had on Japan Airlines business class departing from Narita, which I hold to be the best inflight meal I’ve ever had. I popped into the loo even though I already knew what to expect on the 77W. 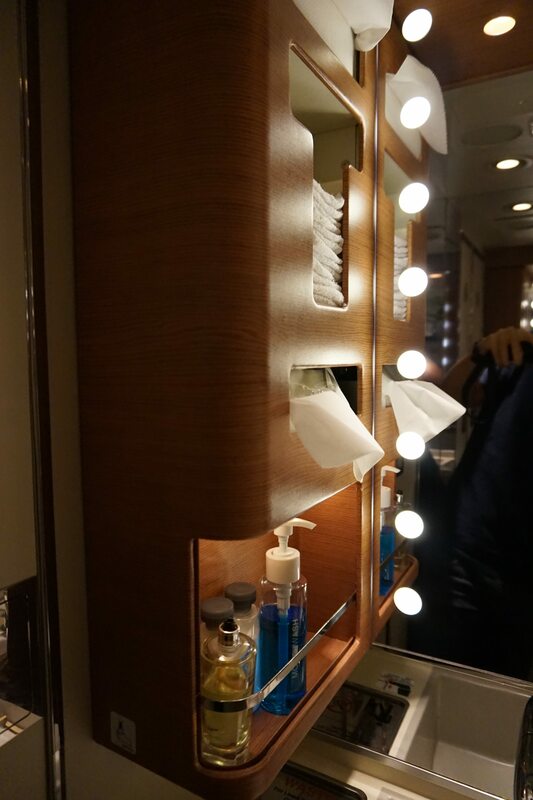 I like that SQ has gone with glamour lights in their bathrooms, but maybe the dehydrating cabin of an aircraft means you don’t want to see yourself in too much detail. 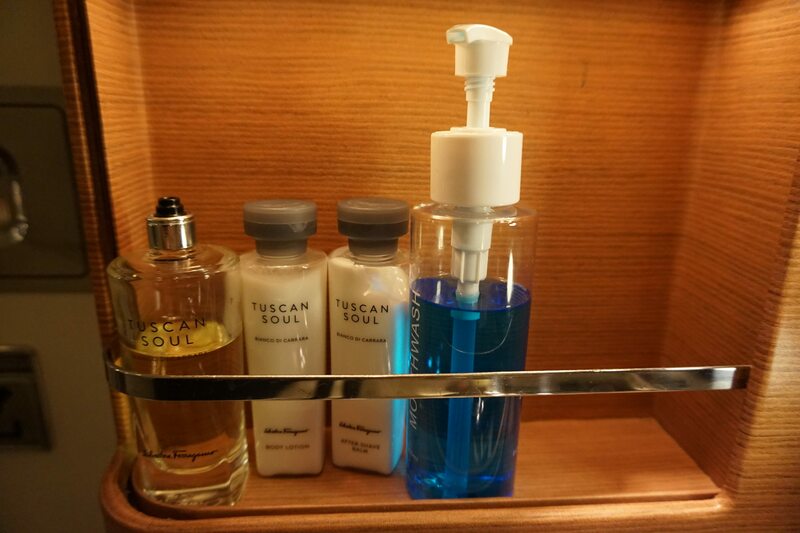 The usual Tuscan Soul amenities can be found in the bathroom, along with mouthwash. 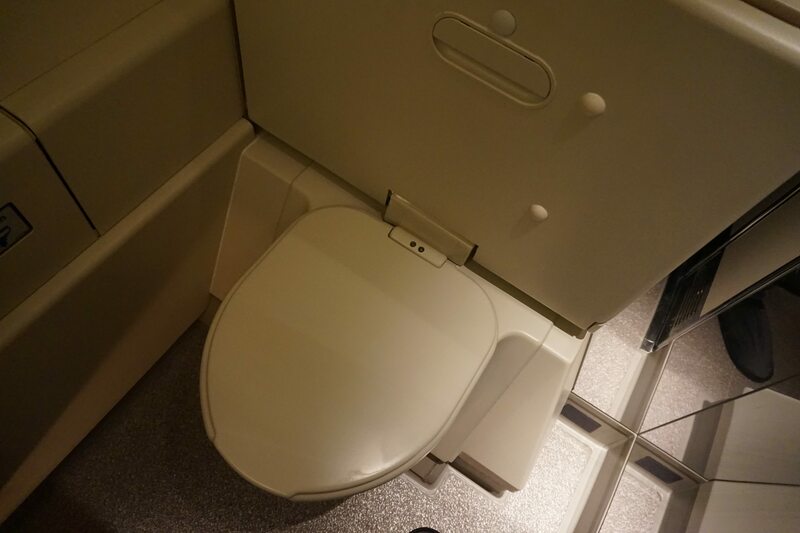 The toilet doesn’t have a bidet, which I’m sure is a major faux pas on Japan bound flights. 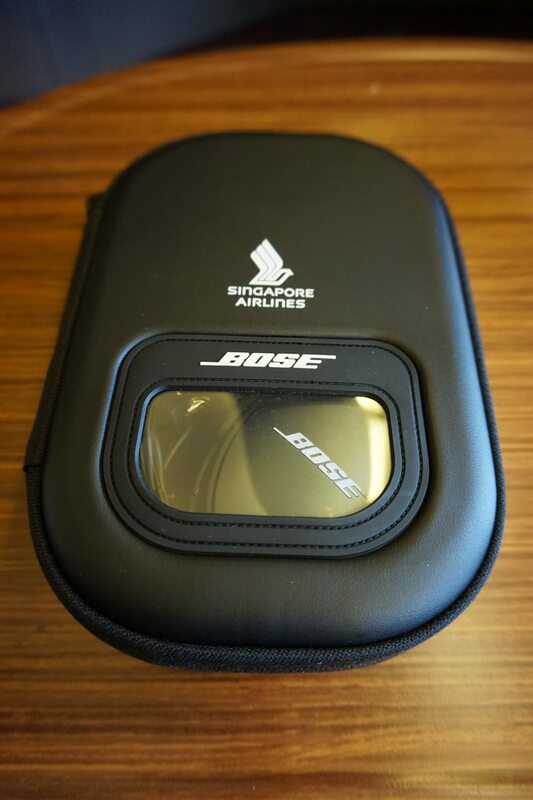 I realise that it’s probably not financially feasible for SQ to install bidets just on its flights to Japan (plus, think of all the implications for aircraft rostering), but I have come across some portable options in case the head of SQ procurement is reading this. Got your back, bro. The tap in the bathroom is automatic. 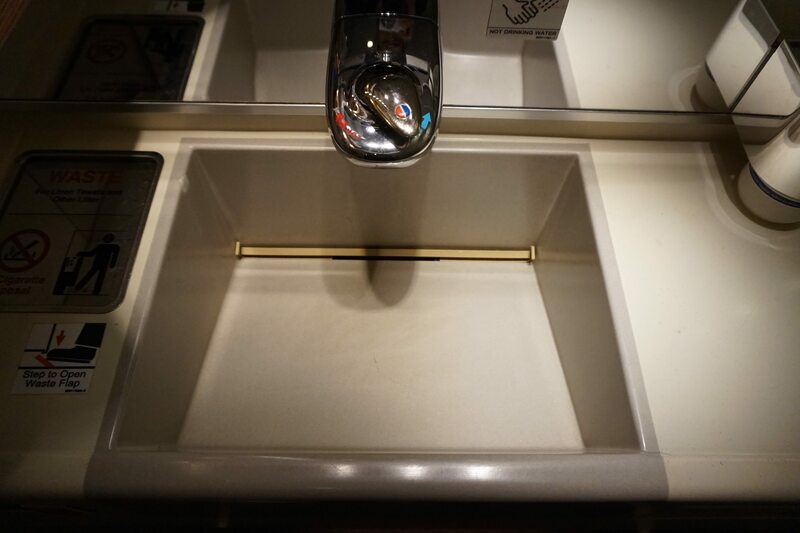 I’ve said enough about recessed vs protruding sinks, so I’ll leave it at that. I just want to point out that this is one of the special SQ 70th anniversary bears. He’s got a special T shirt. 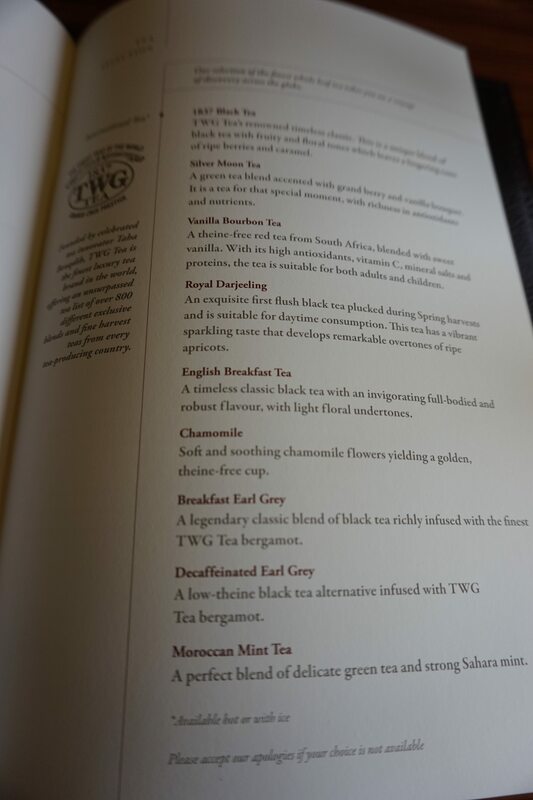 I quickly scrolled through what was on offer in Krisworld for September. Some new movies including The Mummy, the new Pirates movie, the new and improved Baywatch, Alien:Covenant and King Arthur, where David Beckham makes a cameo. No, really. 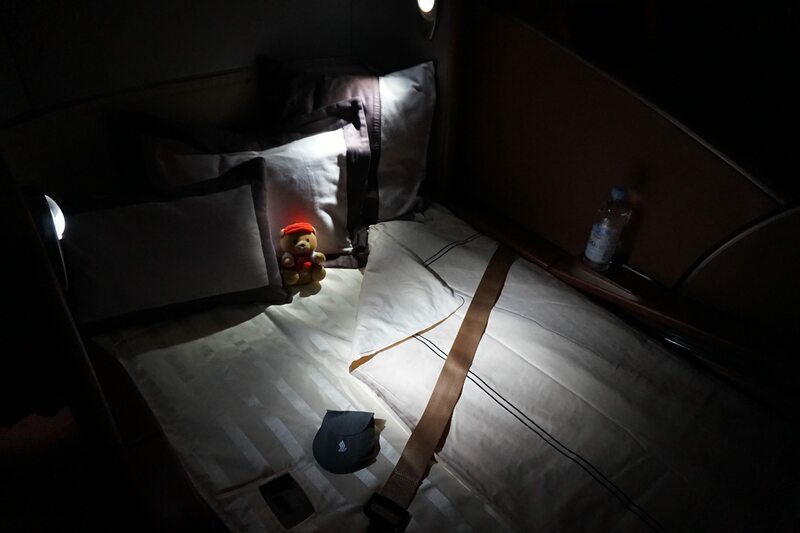 Although I only intended to nap for an hour, the bed was so comfortable I ended up sleeping the full stretch and was glad I asked the crew to wake me at the 2 hour mark before landing. Fortunately, there was still caviar left over from the meal service. 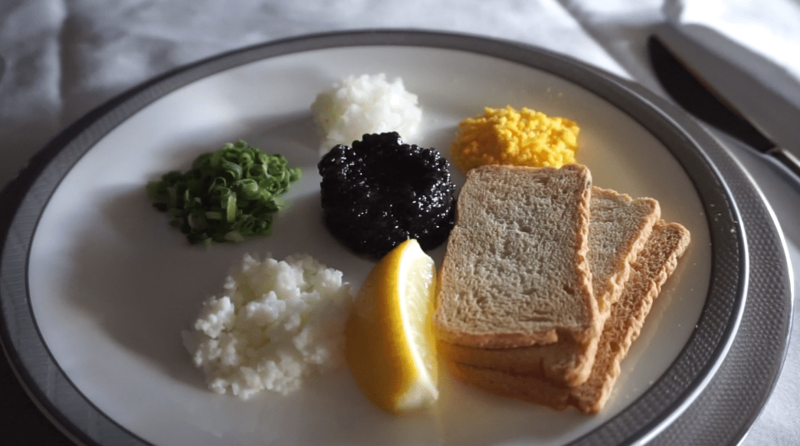 I don’t know what I can tell you about caviar, other than it never gets old. But the caviar was only the distraction before the main event (how often do you say that?). I whipped out a cup from my bag, handed it to the crew and told them to plate it as they saw fit. A few minutes later, I had a steaming bowl of noodles delivered to me, garnished with bok choy, carrots, mushroom and chives. 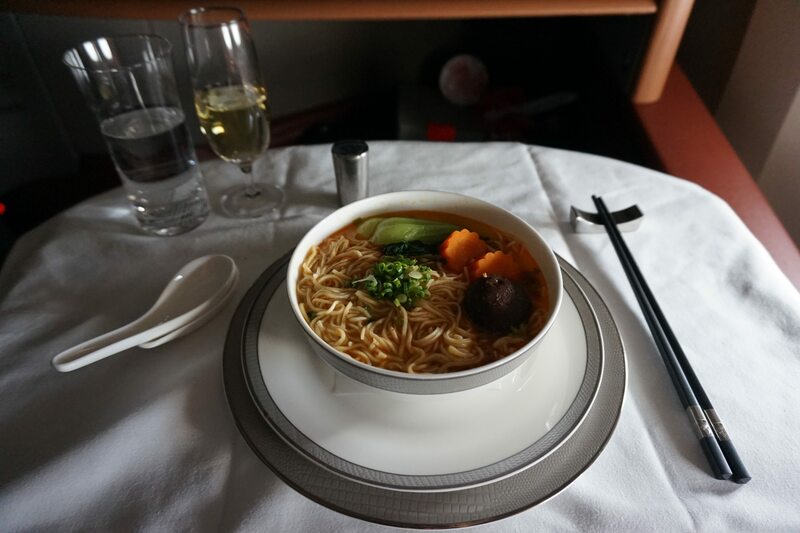 The leading stewardess mentioned that she didn’t want to overdo it with the dressing so as not to interfere with the original taste of the noodles. 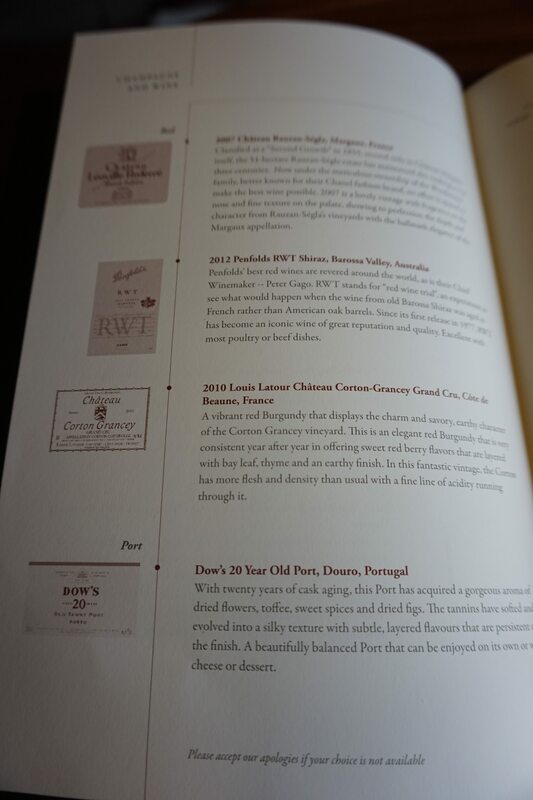 Another glass of Krug was poured, and the tasting began. 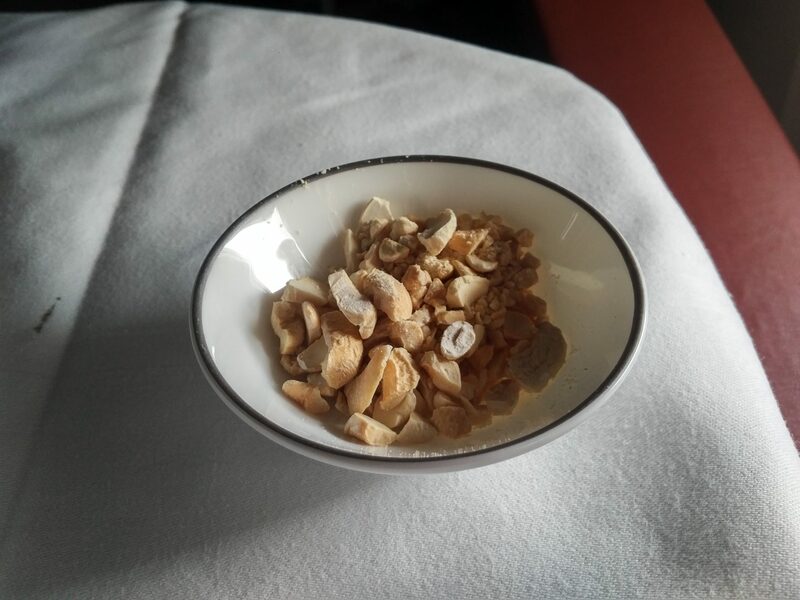 I know that the actual Nakiryu restaurant puts some ground up cashews into their soup for an additional nutty kick, so I asked for that on the side too. 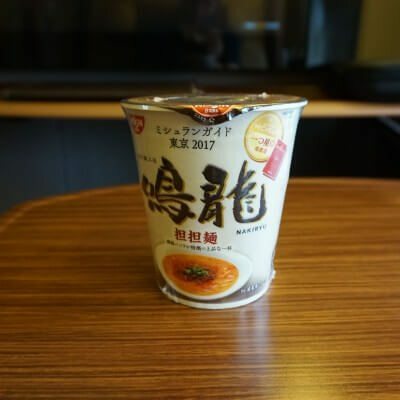 Were these unlike any cup noodles I had before? Yes. Were they life changing? 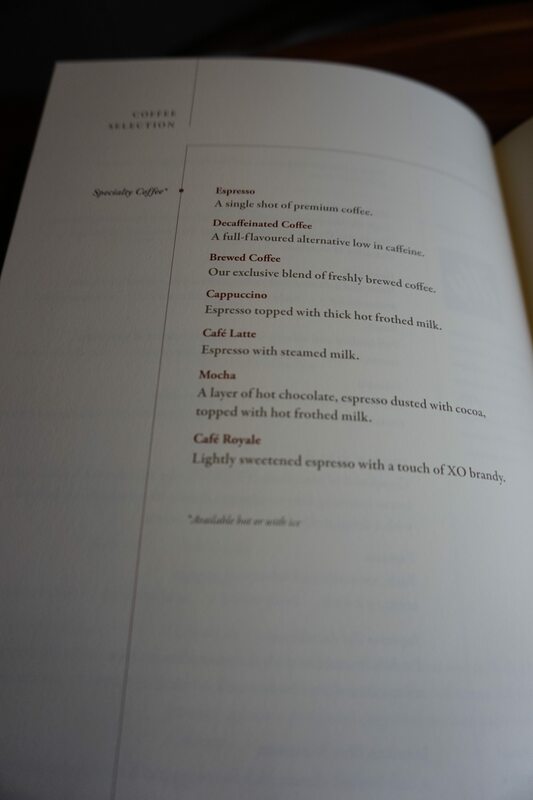 Well….hyped up things often have difficulty living up to expectation. I’d say they were good, but it’s the sort of thing I only needed to try once in my life. 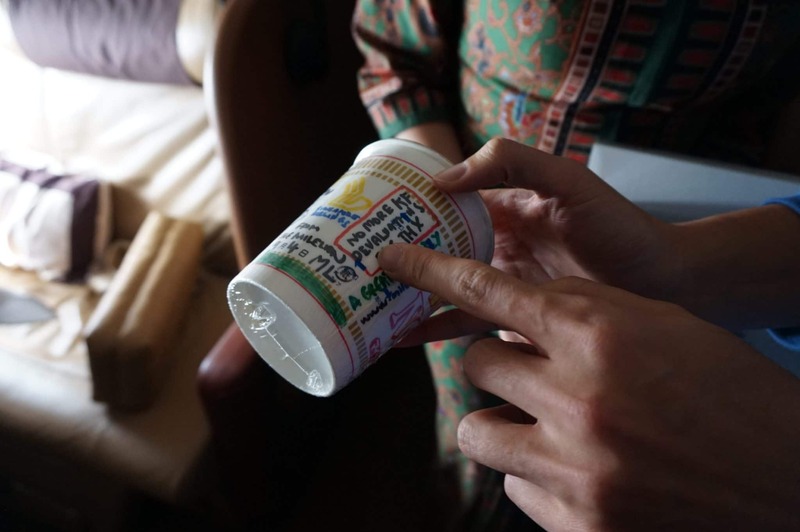 Out of curiosity I asked the crew if they could show me the rest of the cup noodles they normally serve on board. 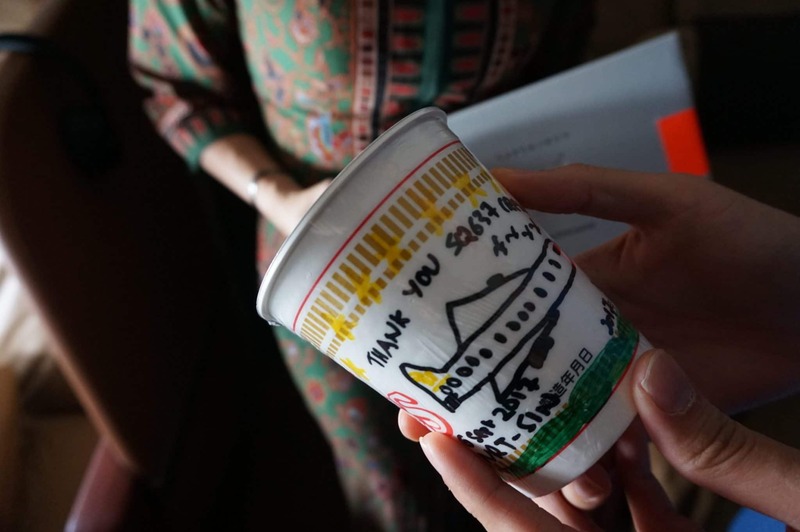 Unlike JAL, SQ doesn’t have special cup noodles adapted for high altitude. The noodles they use are just like the ones you’d buy off the shelf at a supermarket. 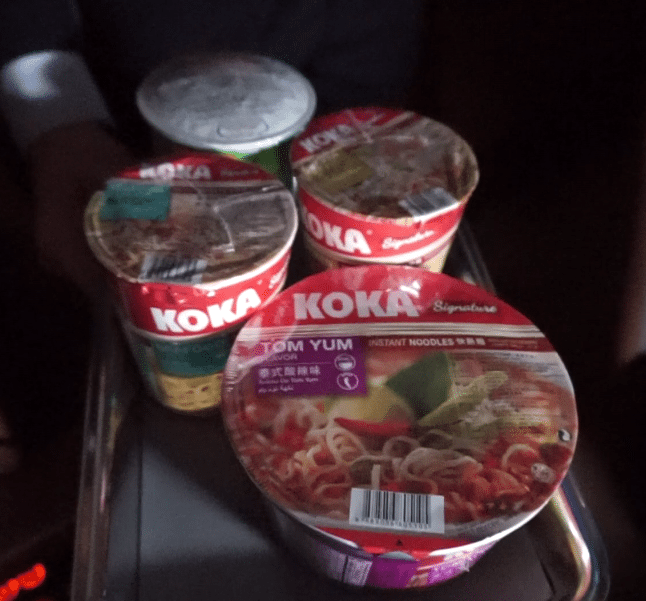 Apparently, the tom yum noodles are the most popular, which isn’t that surprising given that at high altitudes, there’s nothing like a bit of spice to clear the nasal passages. I wanted to present the crew with a token of appreciation for accommodating me, and asked the inflight supervisor if he could help shoot a little video of the presentation. 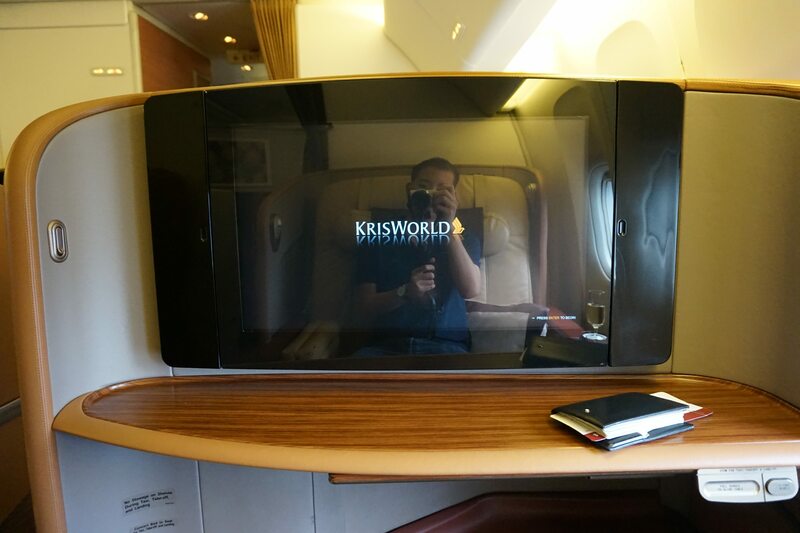 I then learned that SQ has…very peculiar rules regarding filming on board. So SQ’s rules are really strict, but with some creative thinking you can get around them! FYI- it’s not like I didn’t try reaching out to SQ’s media team. I did. And was promptly ignored. 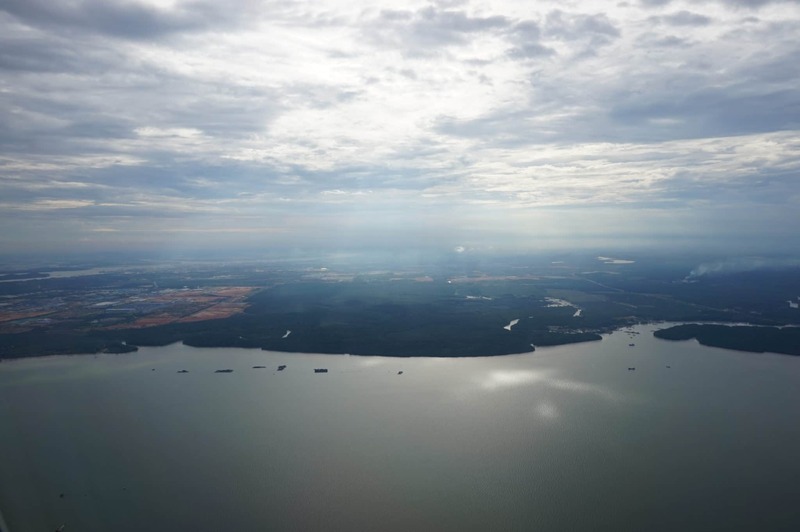 There were lovely views on our descent to Changi. 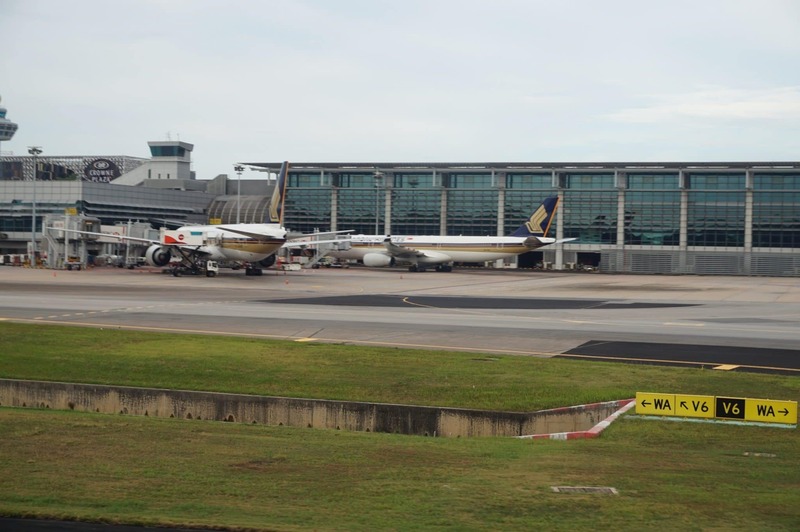 We landed at Terminal 3 and after a quick taxi parked near the Crowne Plaza hotel. And that brings us to the end of the Tokyo Ramen Run! 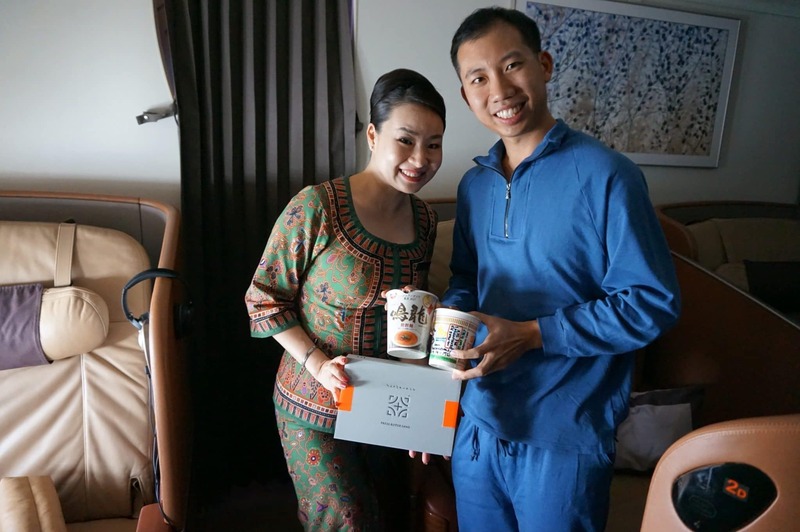 Finally, I can scratch off having Michelin Starred instant noodles at 30,000 feet in the air with caviar and Krug while wearing PJs from my list. 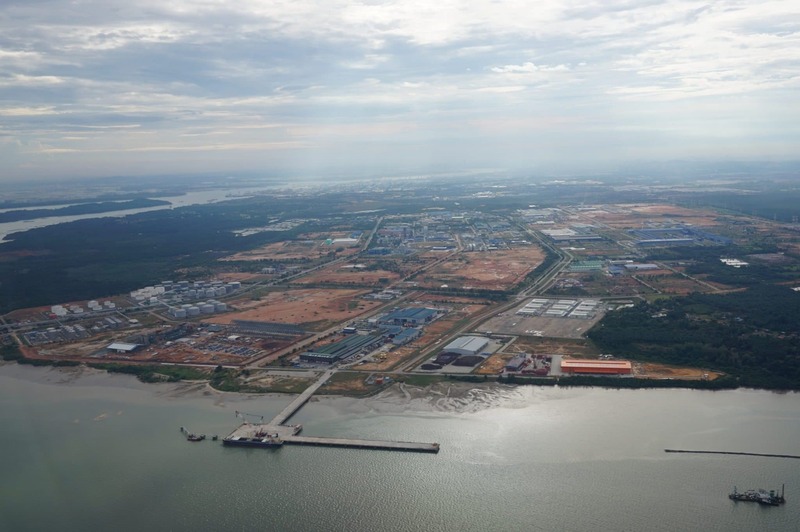 PS: In case you’re interested, here’s some bonus material from my subsequent visit to Class 95 to talk about miles, ramen and my five point plan for bigger triceps. ‘Tis strange, I admit, but it’s spelt ginkgo not gingko. 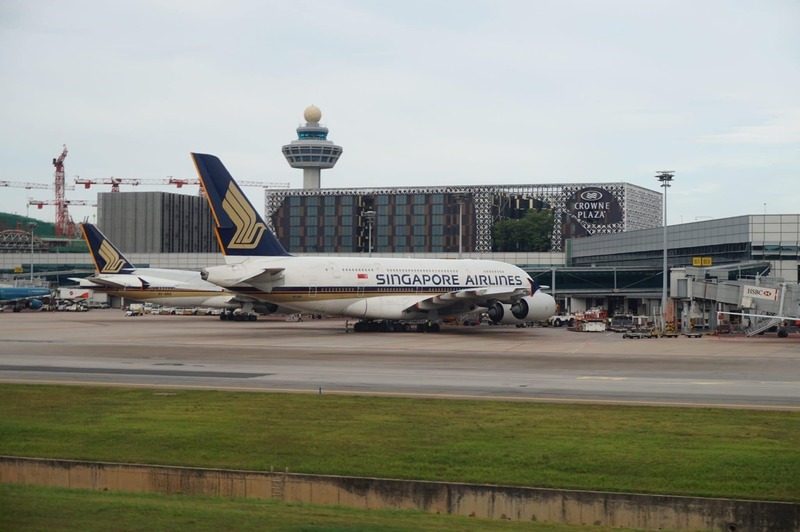 Regarding the meal service right after satay, it is actually dependant on the time of departure. 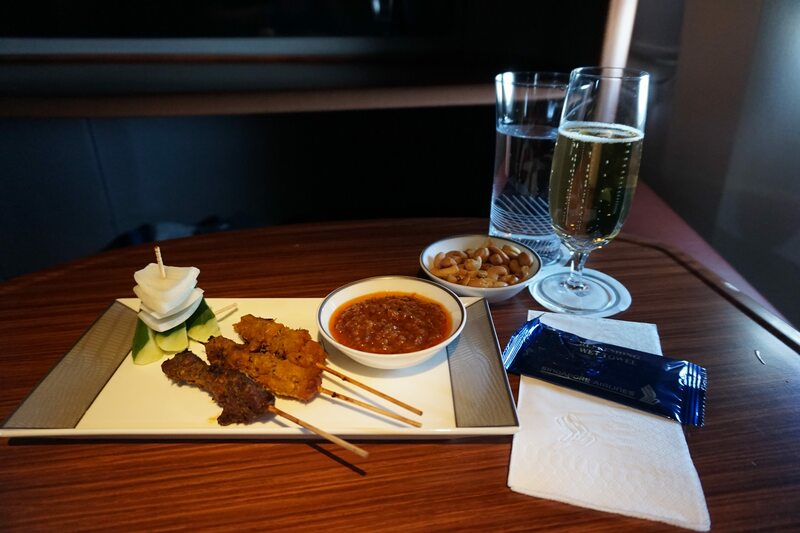 On a recent SQ807 from PEK which departed 1635, satay was served 30min after takeoff, but dinner was only served at 1830. The cabin crew came around informing everyone about dinner time while serving satay. 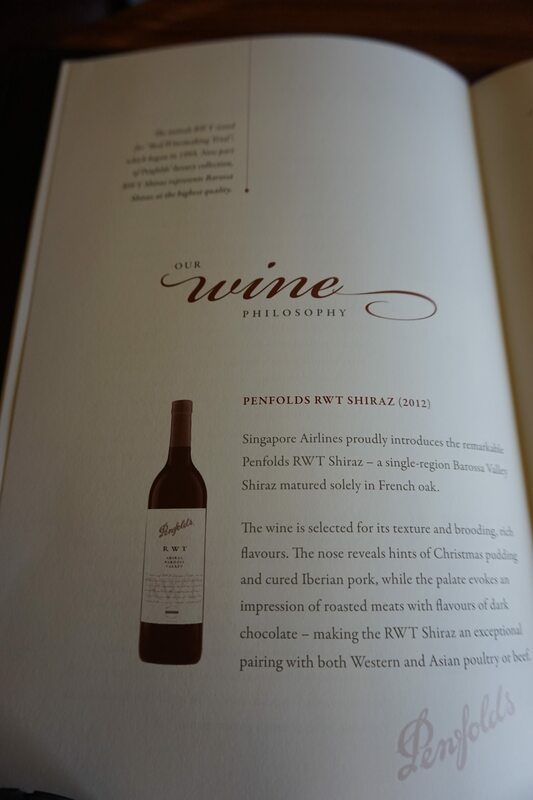 it went well with the desert. The sponge cake was that dry? Btw I take your point about the wok fried chicken but it would be fine with me as long as got wok hei…. I usually just ask for 3 bottles of water from the start, rather than depend on ad-hoc refills.